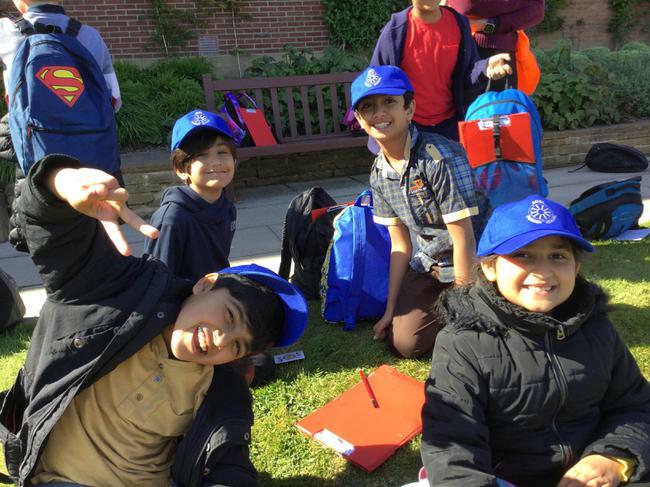 Welcome to the final summer term! 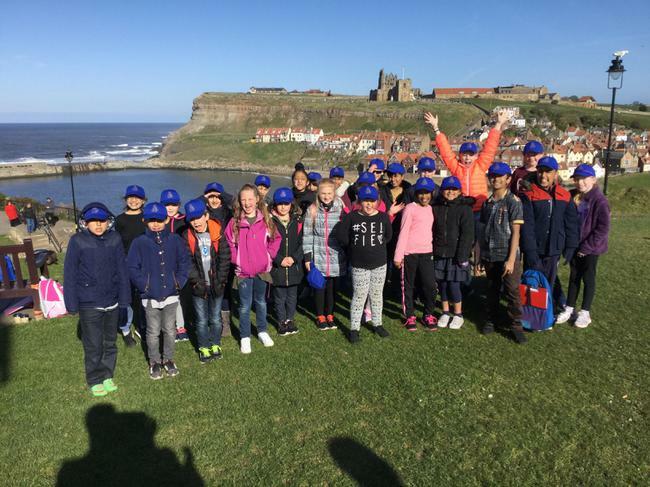 I hope you had a restful half term break. 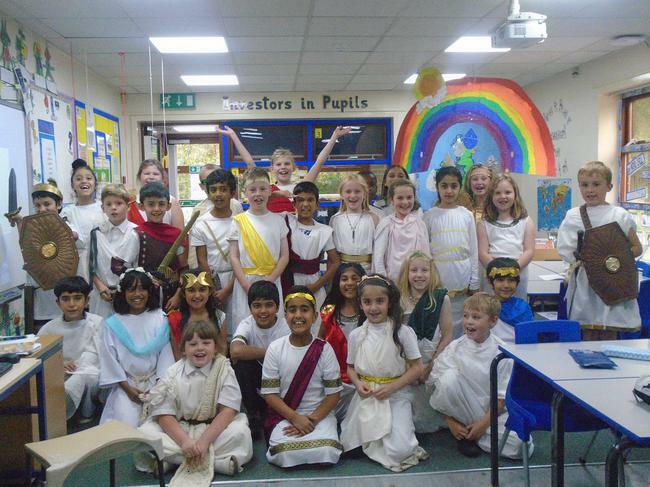 This half term our topic is ‘One World’, which will run throughout all of our subjects in class. 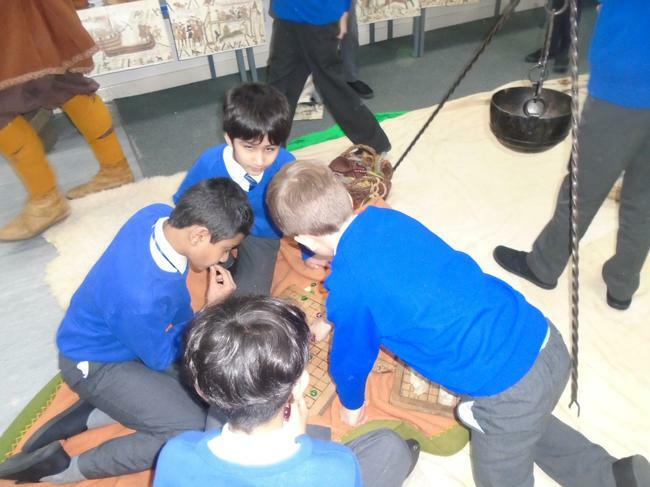 Here is a brief overview of what the children will be learning about. 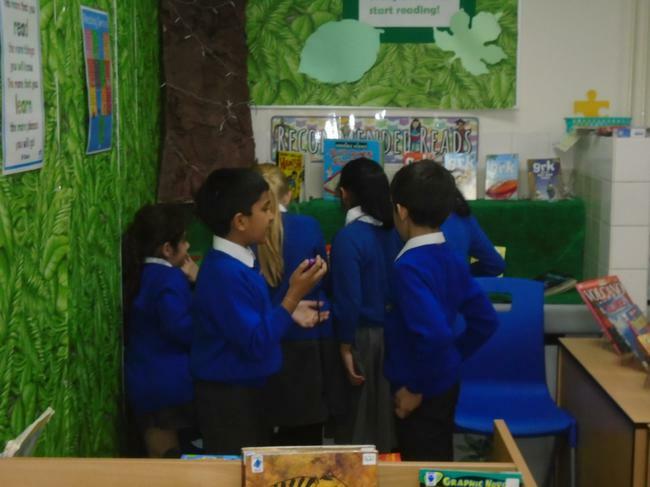 In science and geography, we will be exploring living things and their habitats. 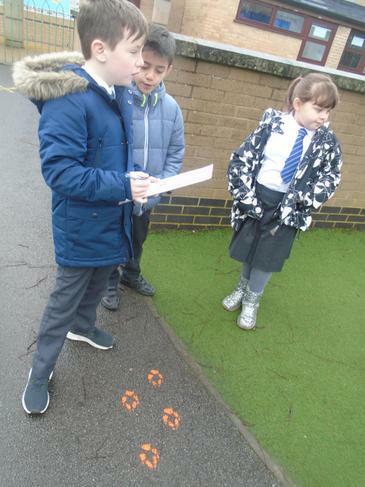 We will find out how all living things can be classified and go outside to identify plants and animals in our local environment. 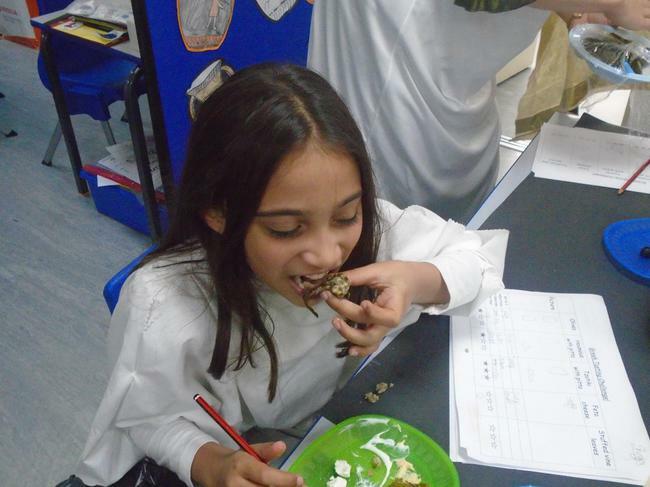 A big focus will be to recognise that environments can change and that this can sometimes pose dangers to living things. 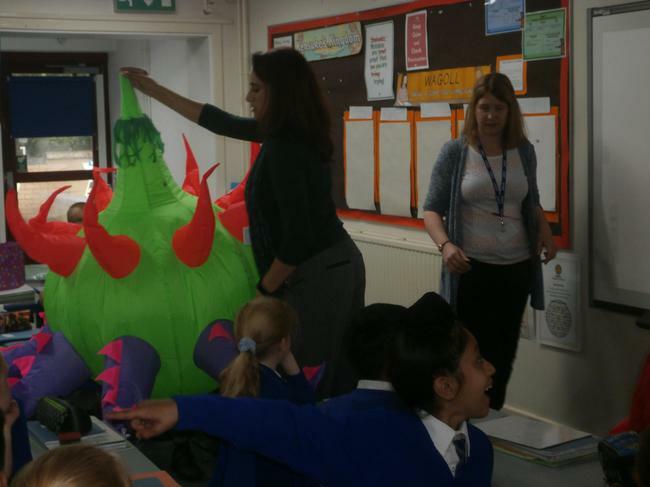 As part of this, the children will find out about both positive and negative ways that humans can impact other animals living on the planet. 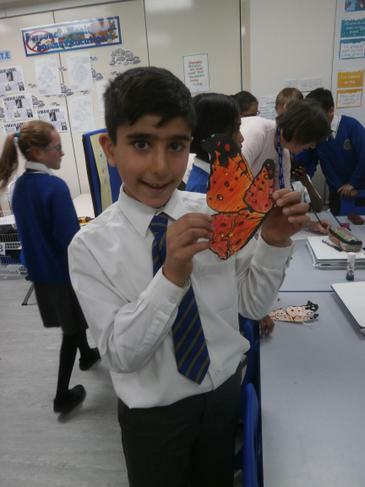 We will discuss critical issues such as climate change and deforestation as part of this and the effect that these have on different habitats and the animals that live there. 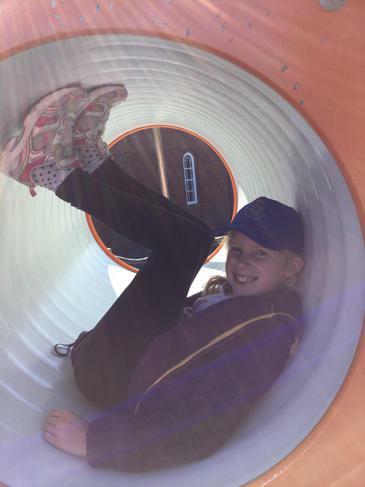 Next week, it is Drowning Prevention Week. 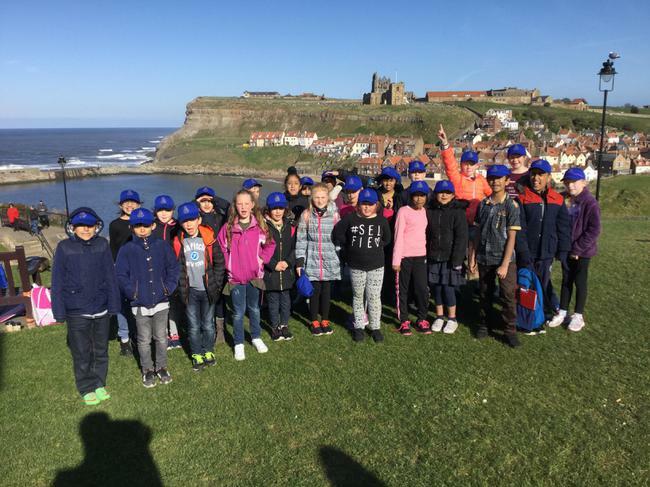 In light of this, on Wednesday 21st June, year 4 will be taking part in a practical water safety session during our swimming lesson time. 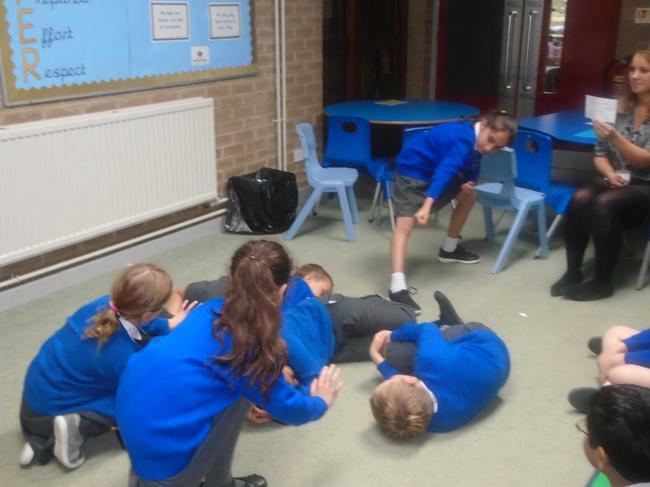 This will be led by trained lifeguards, as usual. 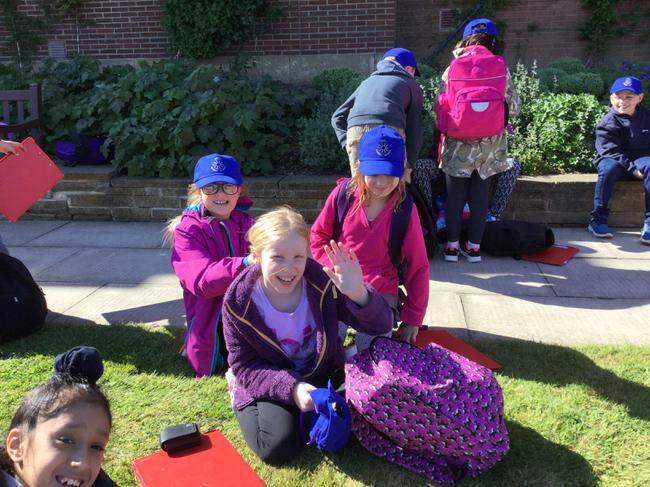 As well as their normal swimming kit, the children are also required to bring extra clothes to wear over the top of their swimming kit: T-shirts and shorts would be ideal. 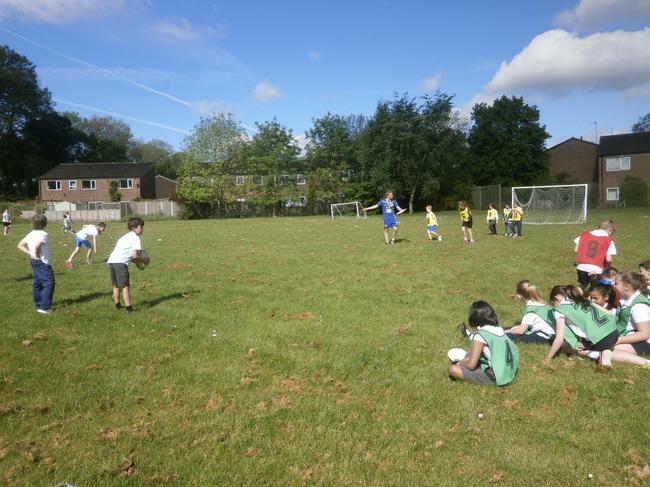 Please ensure that these are packed for next Wednesday! 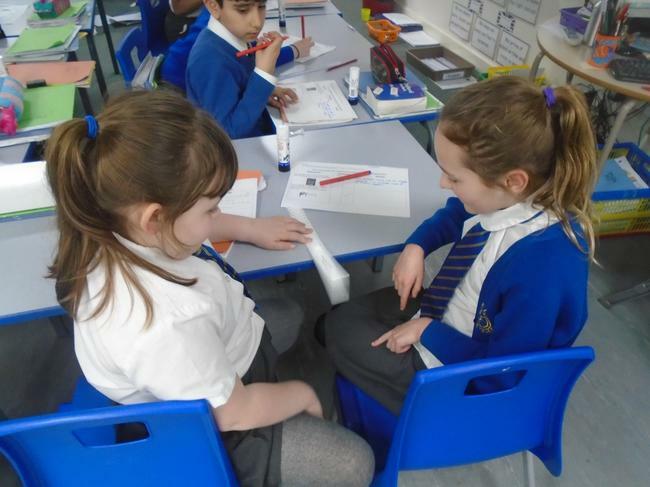 Please don’t hesitate to ask if you have any further questions. 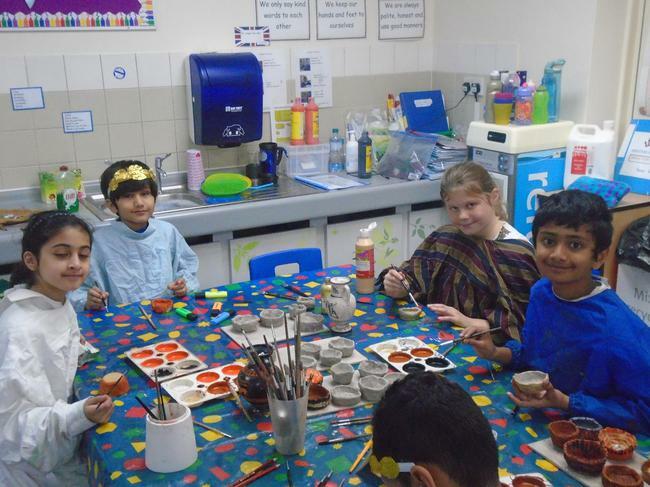 Martin House art morning with artist Sarah Jane! 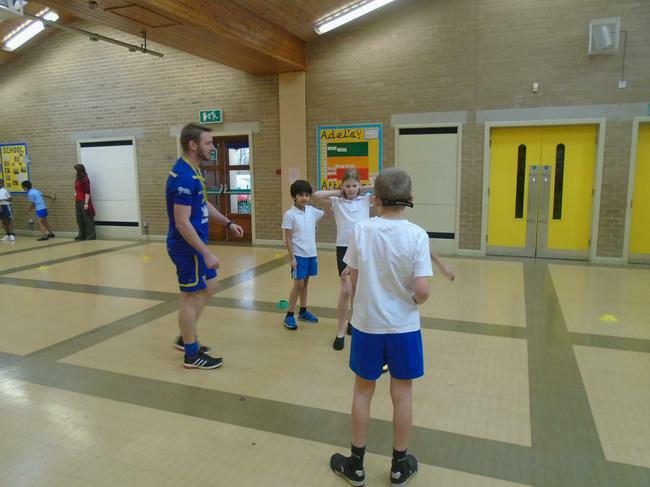 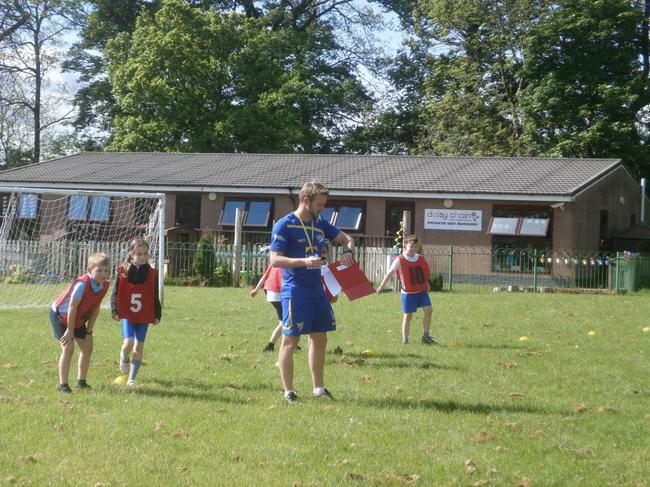 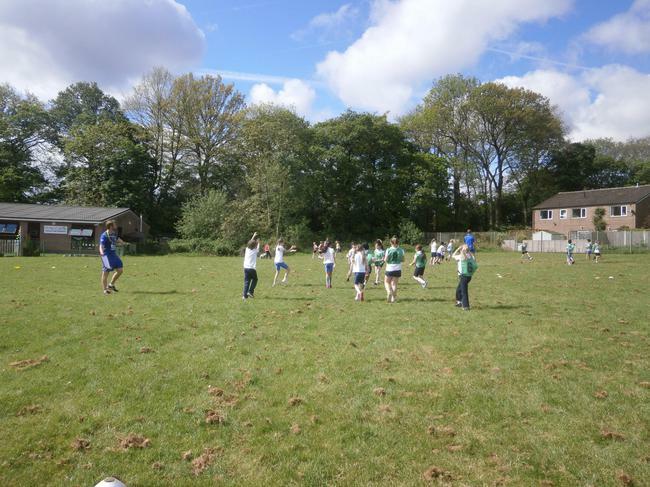 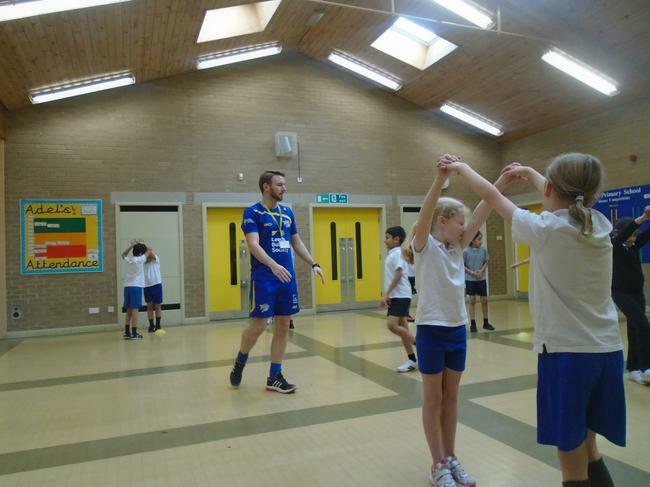 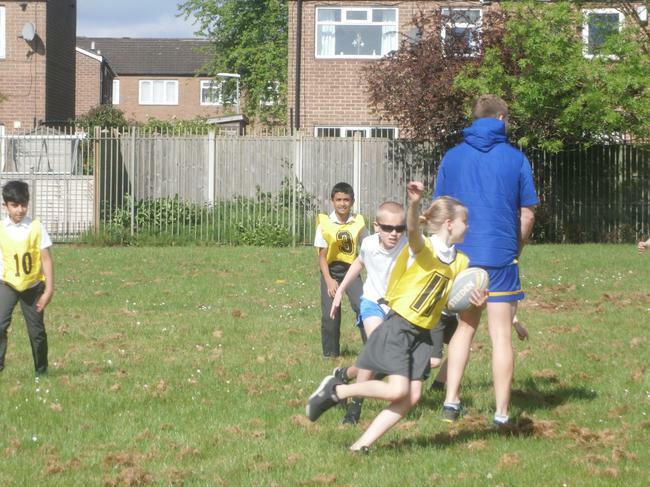 Year 3 and 4 rugby tournament- led by Leeds Rhinos! 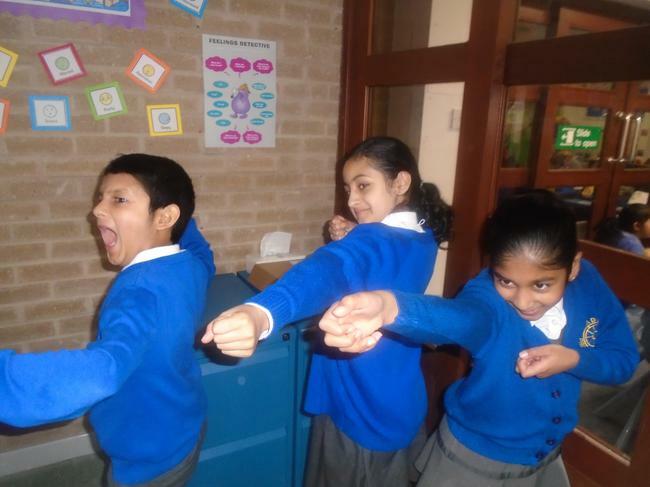 English, Maths, Science, ICT, RE, PE, Music, French, History, Geography. 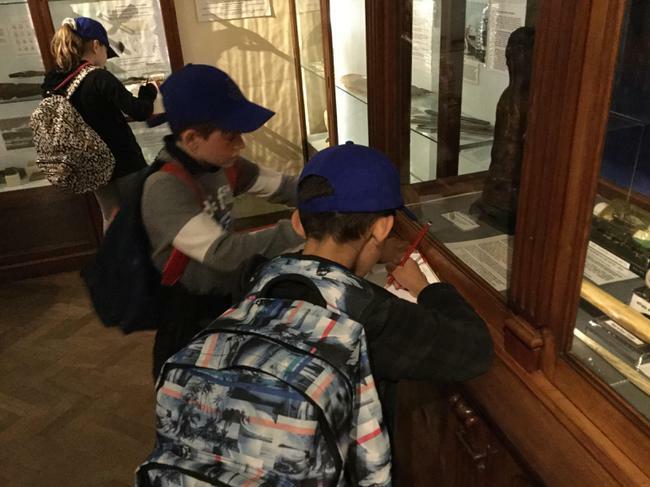 I will update this list as the year progresses. 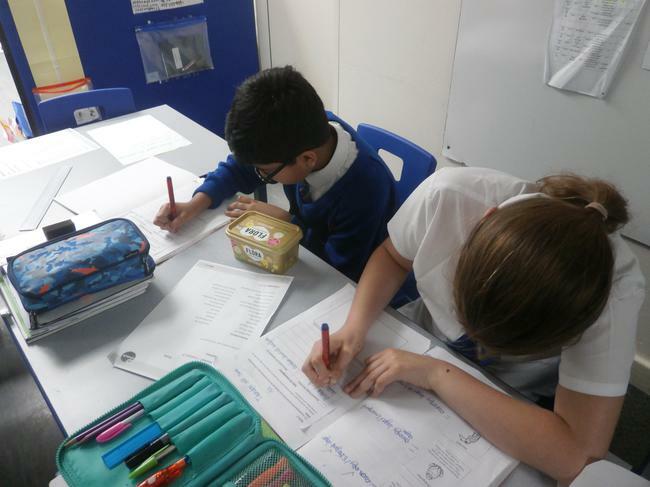 Please ensure that you return the EVH2 consent form and meal choice by Tuesday 2nd May. 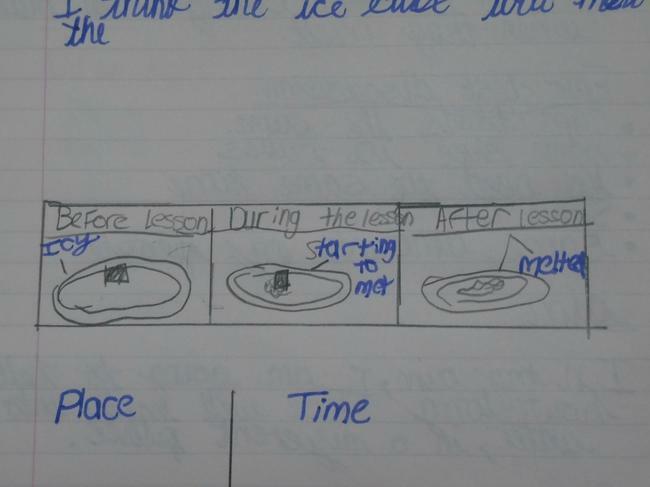 I need to inform the youth hostel of our meal choices ASAP, so require this information promptly. 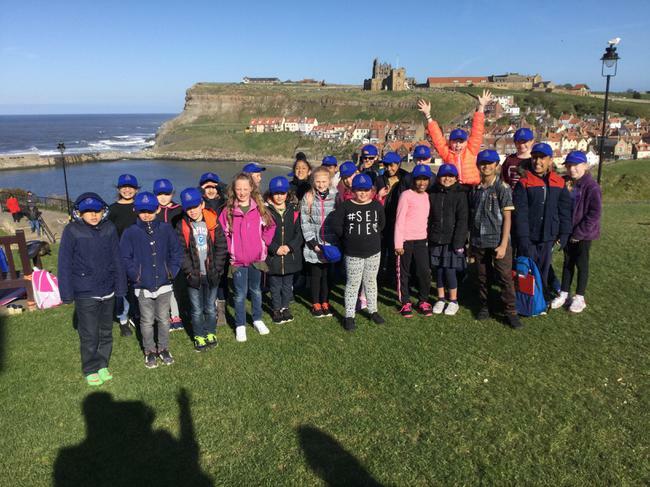 I hope you had a restful Easter break. 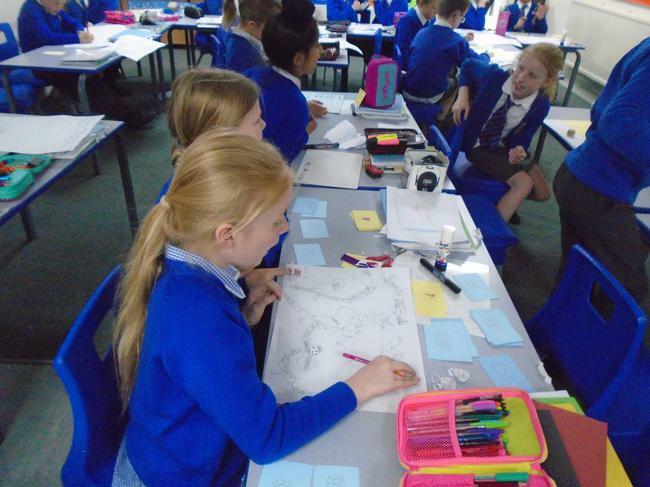 This half term our topic is ‘Map Madness’, which will run throughout all of our subjects in class. 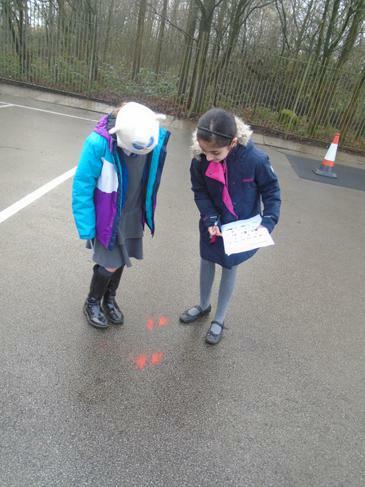 We will be exploring the world through maps! 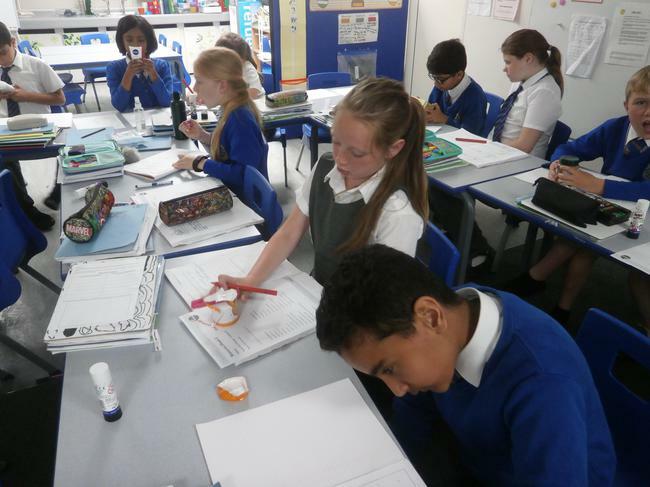 We will recap the continents and oceans, before moving onto investigating how the Earth is defined (including the role of the equator and northern/southern hemispheres). 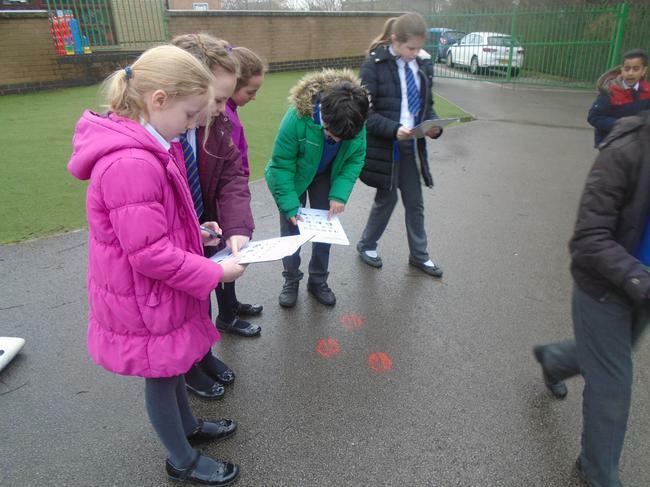 At a smaller scale, we will use local OS maps to investigate features of the landscape and the use of keys. 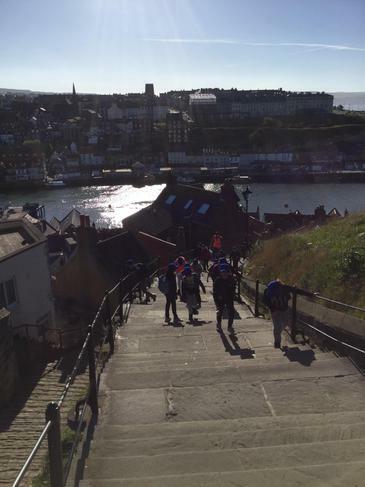 We will also conduct a comparative investigation between the coastal settlements of Whitby and Vancouver. 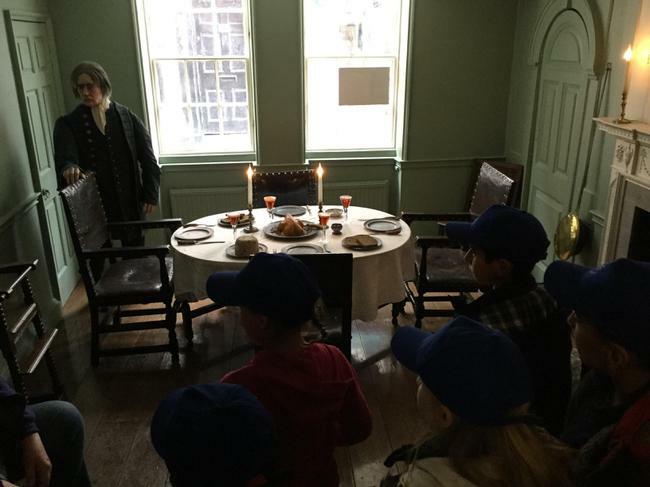 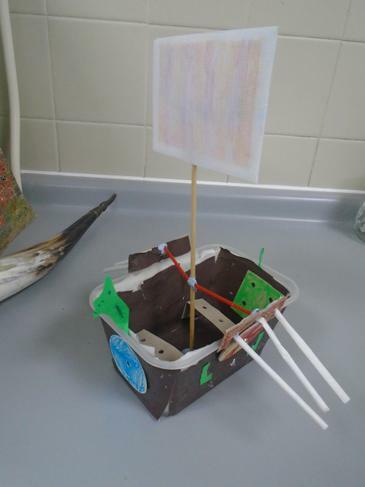 As part of our research about Whitby, we will learn about a significant figure from the past, Captain Cook. 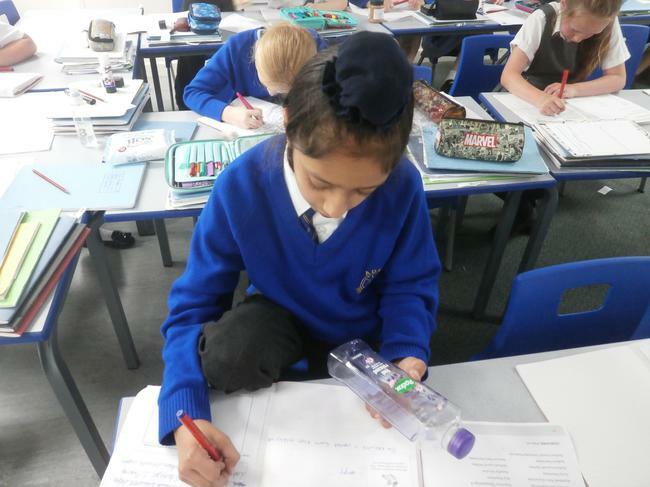 We will also be reading an exciting adventure book called, 'Kensuke's Kingdom' about a little boy who gets washed up on a desert island...but is he alone? 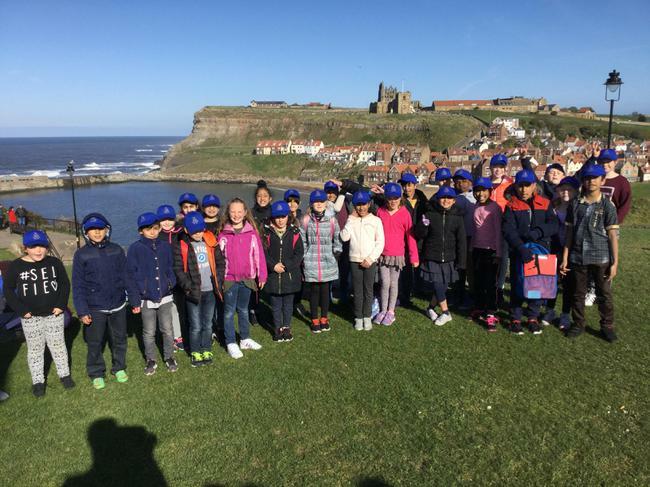 We gave out blue Whitby payment cards today (19.04.17). 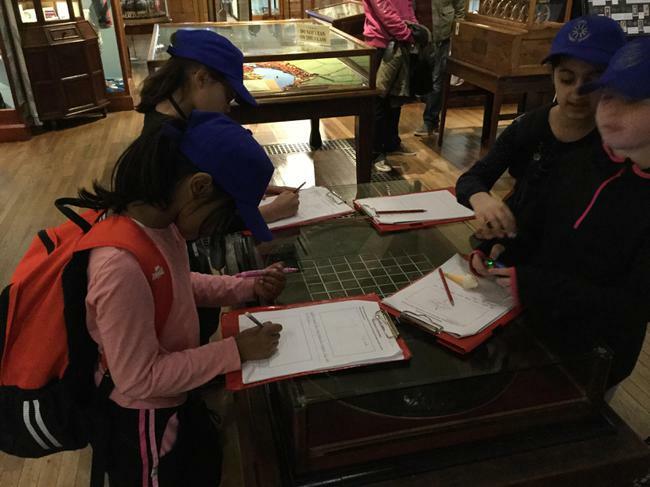 This details the remaining balance and will act as a record between home and school as you bring money in towards the trip. 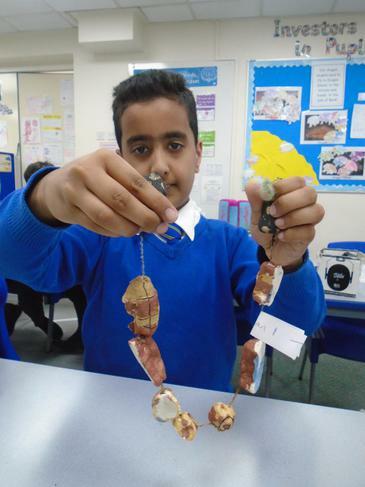 You may pay the remaining balance in as many installments as you like, we just ask that the full balance has been paid by Friday 5th May 2017. 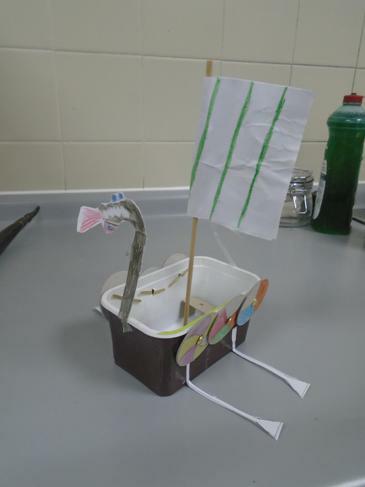 Please bring any monetary payments in an envelope. 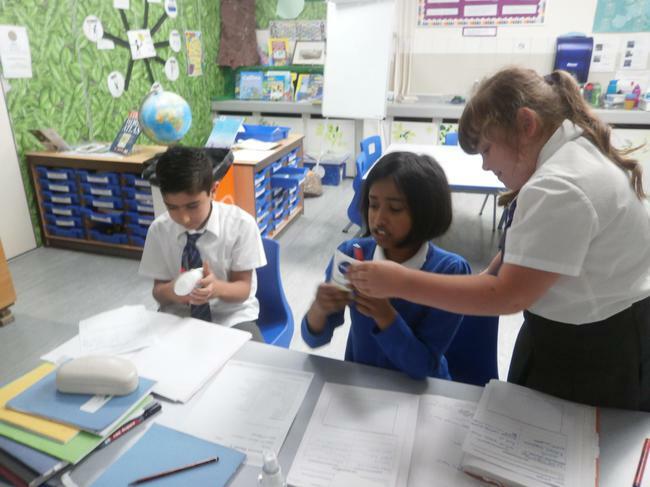 The payment card also needs to come back to school with each payment. 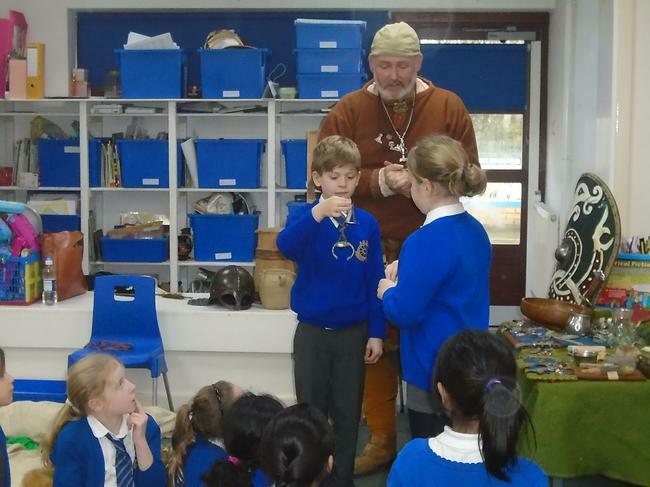 The payment card will then be sent back home with your child as a receipt. 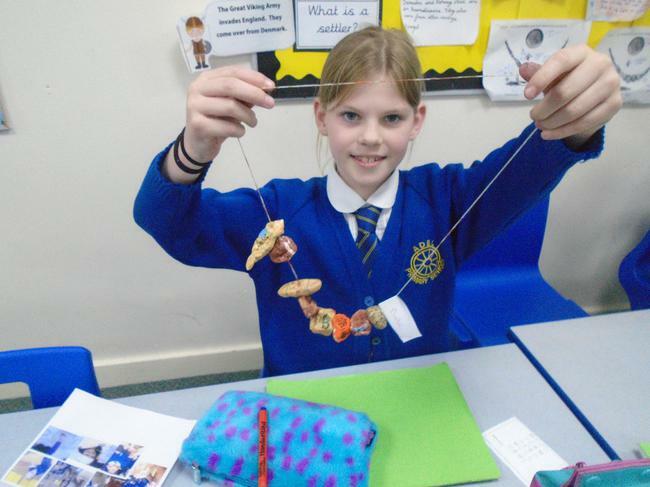 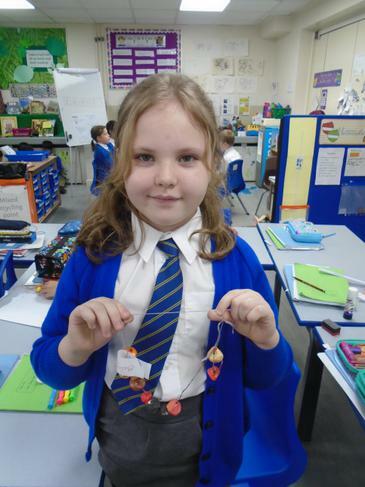 Anglo-Saxon necklaces! 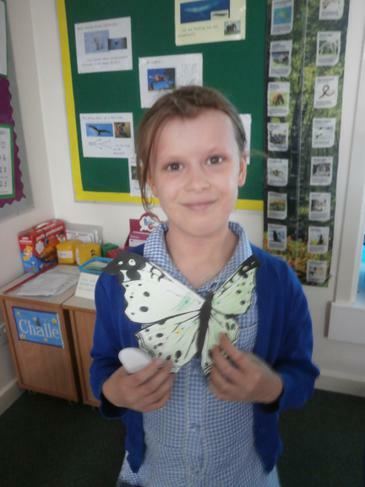 Made with salt dough, paint and felt tips to add detail! 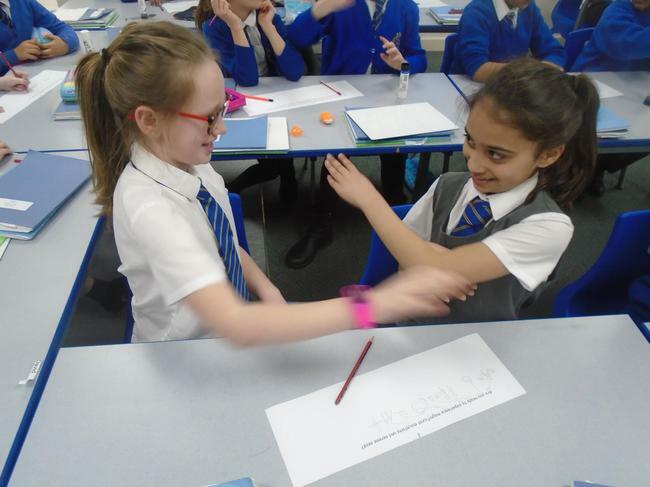 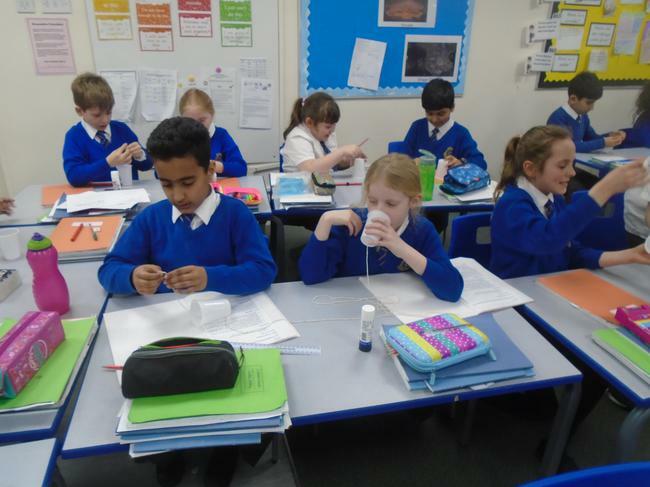 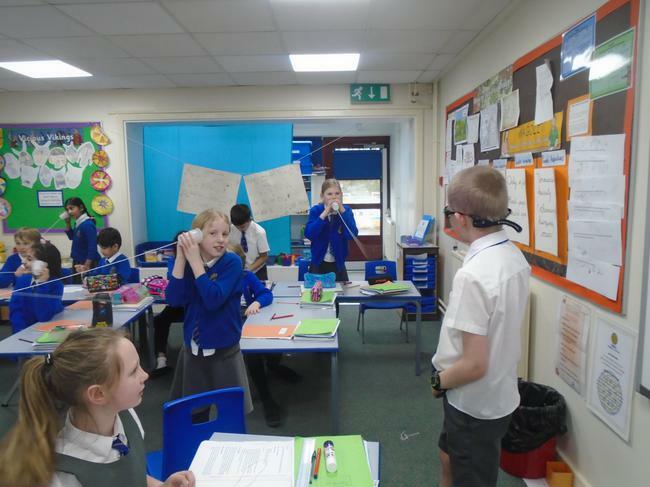 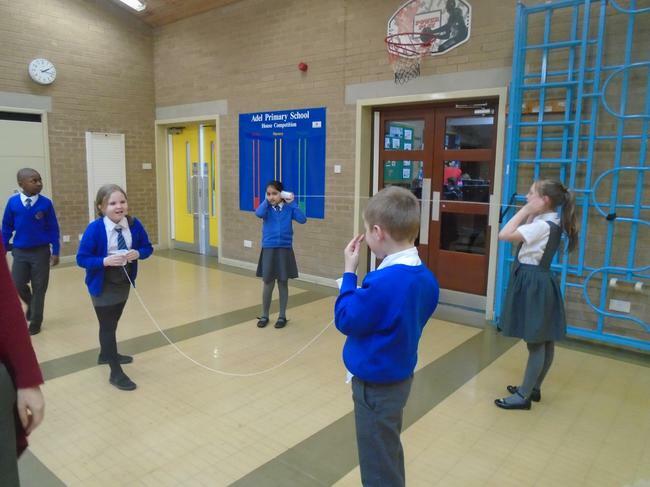 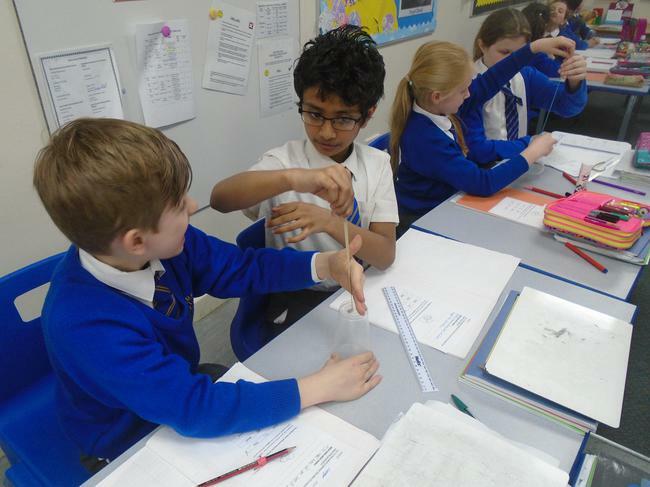 Science: we investigated how we can change the pitch of sounds using elastic bands. 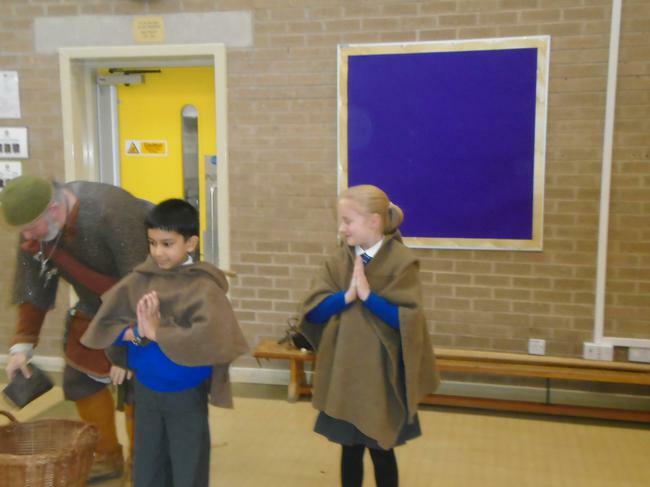 Incredible India! 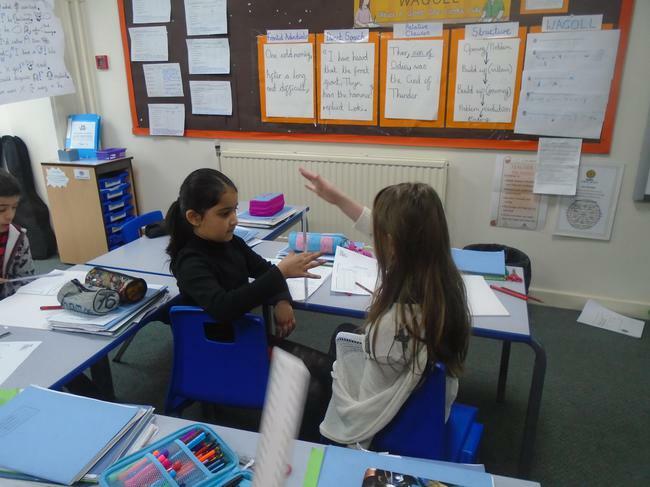 Today, we started to learn a model persuasive text off-by-heart. 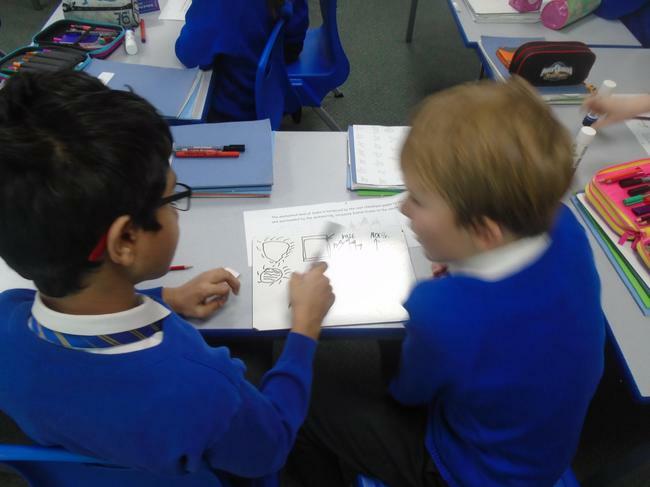 We used pictures and actions to help us learn the text and performed the first 2 paragraphs at the end of the lesson! 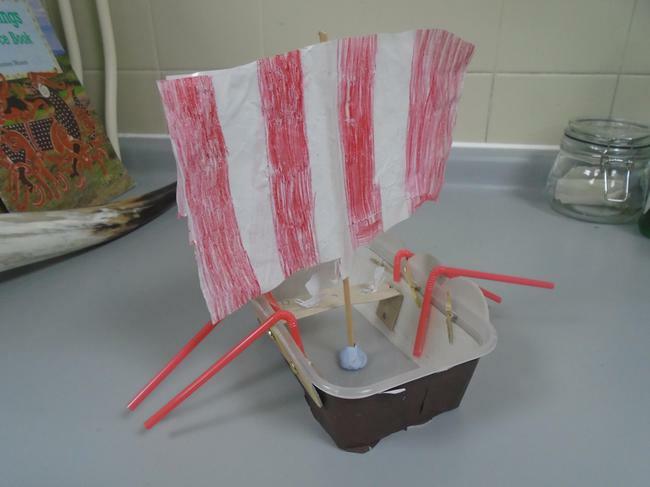 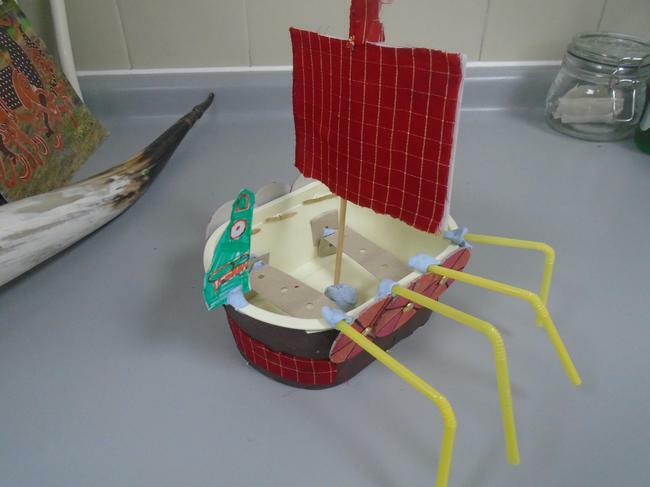 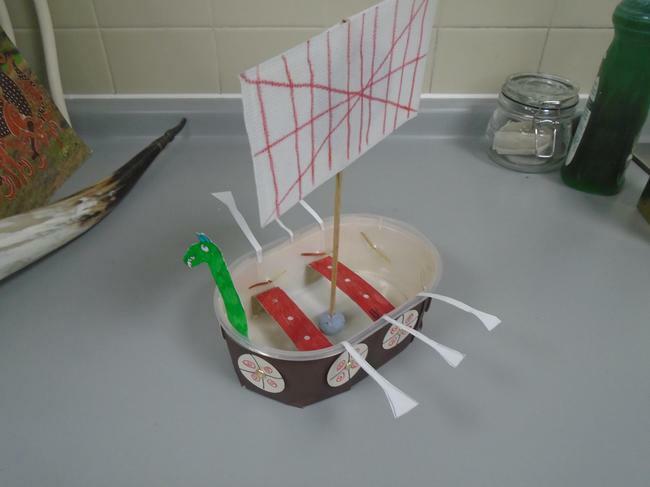 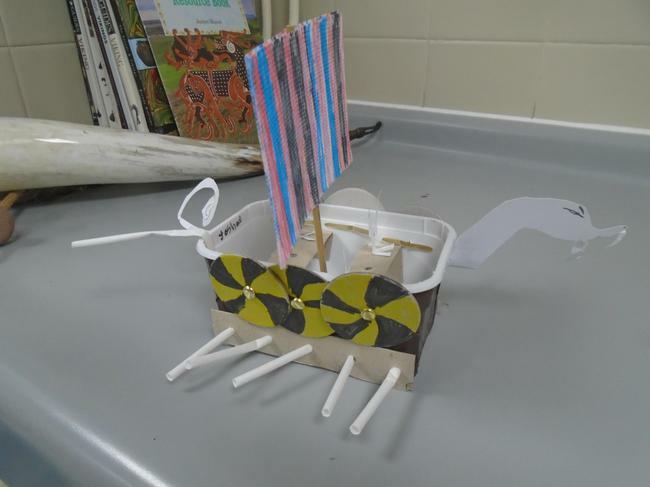 We designed and made Viking longboats in Design Technology! 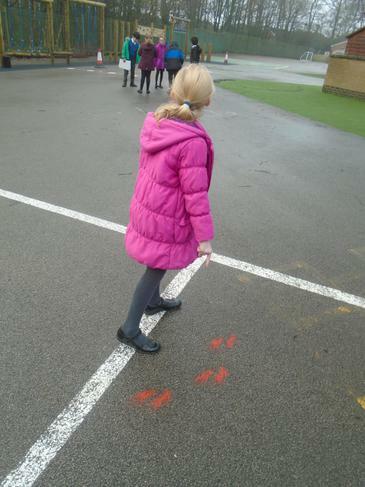 The children really paid attention to detail.... Well done! 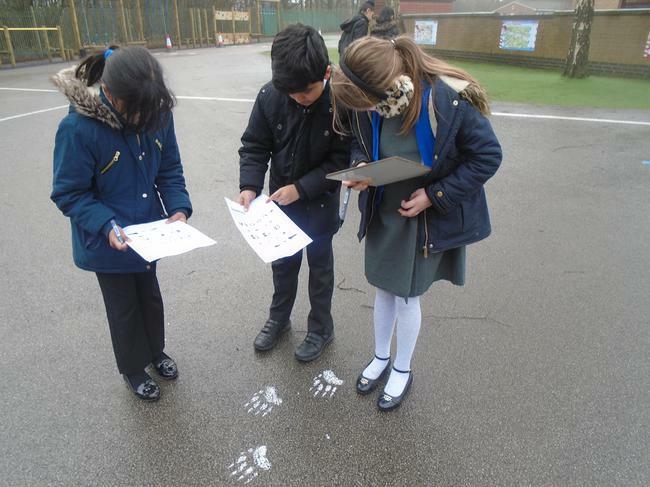 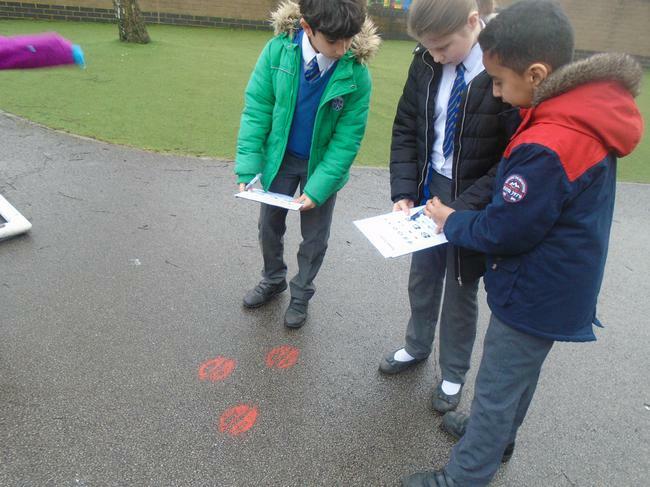 We identified animal tracks on the playground today! 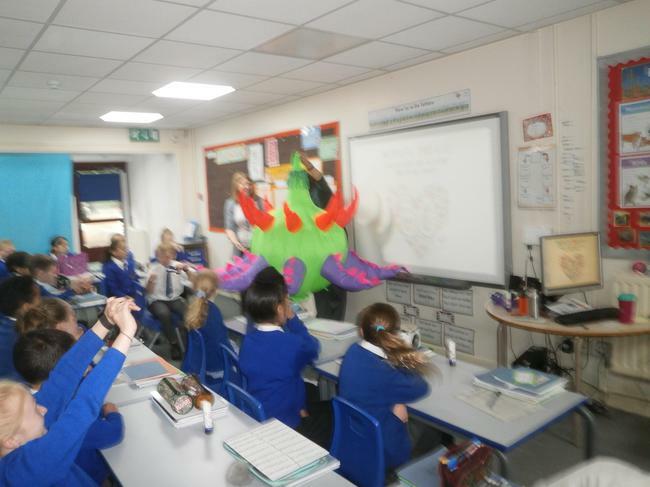 This is to help us with our 'How to track a monster' explanation texts in literacy. 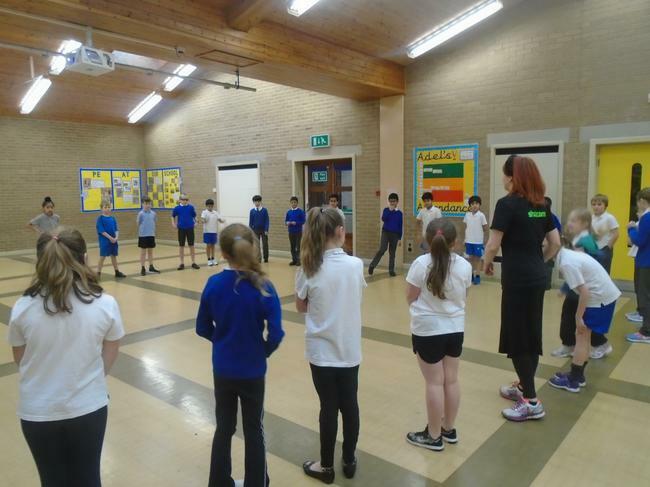 Arts week- Spring-themed dance workshop! 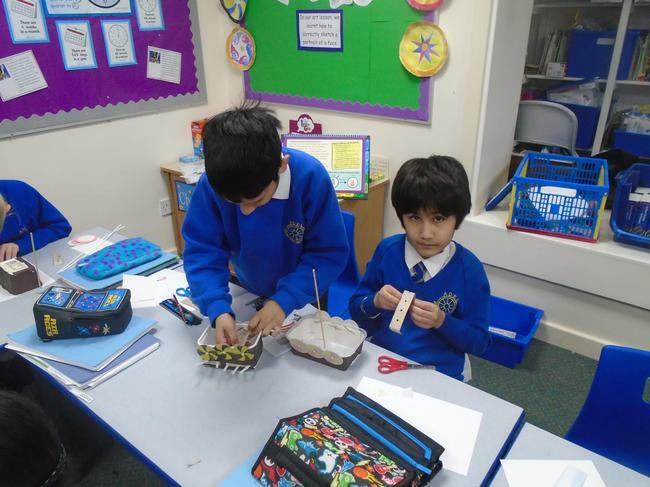 In science, Year 4 have been really busy making and designing their own switches to make a bulb light up in order to complete a simple circuit. 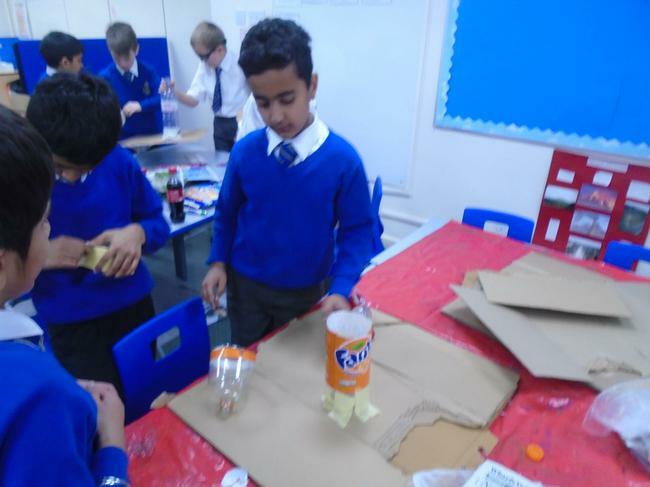 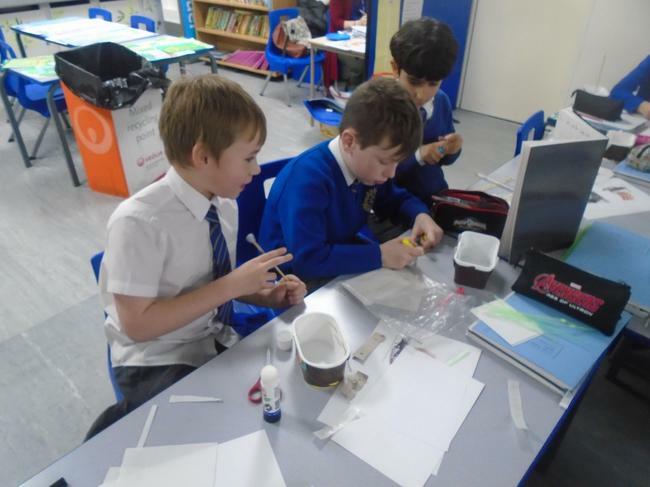 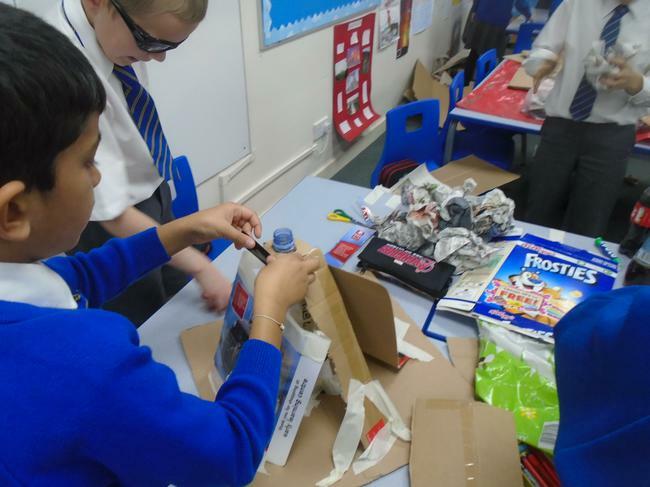 For our design and technology project, Year 4 have started to make their longboats using different materials. 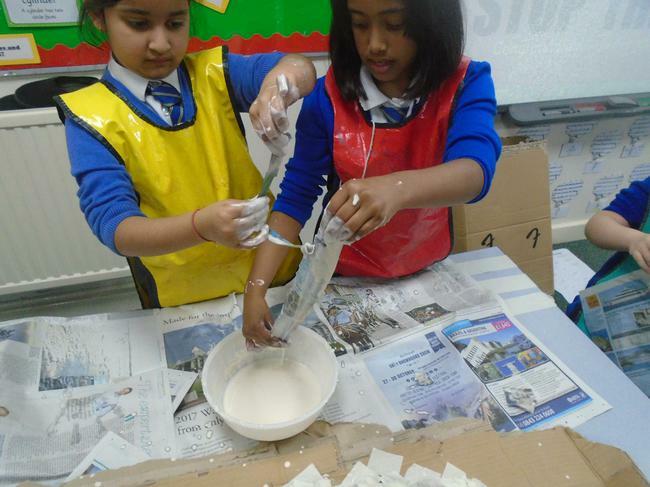 Once they're finished, we hope to put them in a water tray and see which travels the quickest. 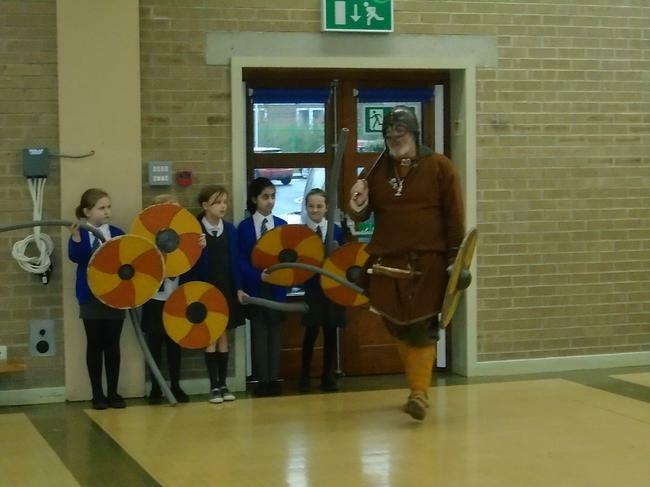 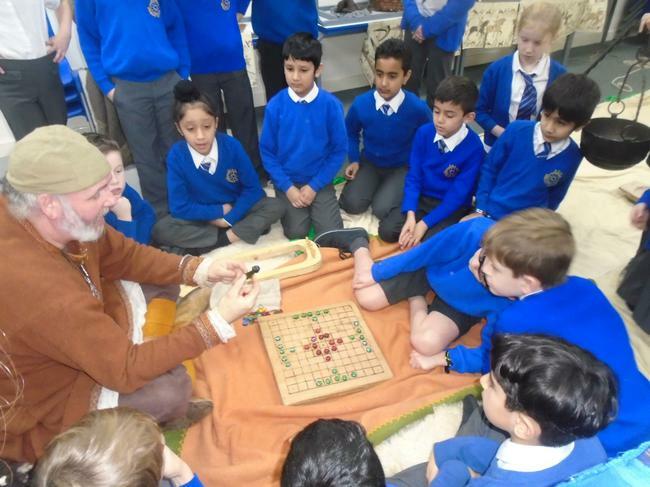 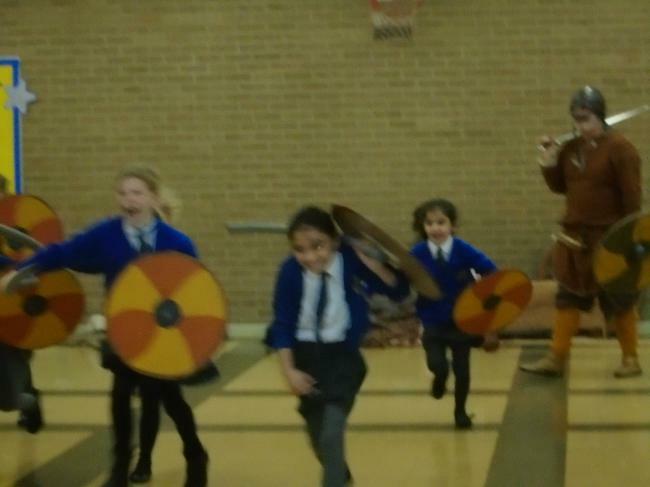 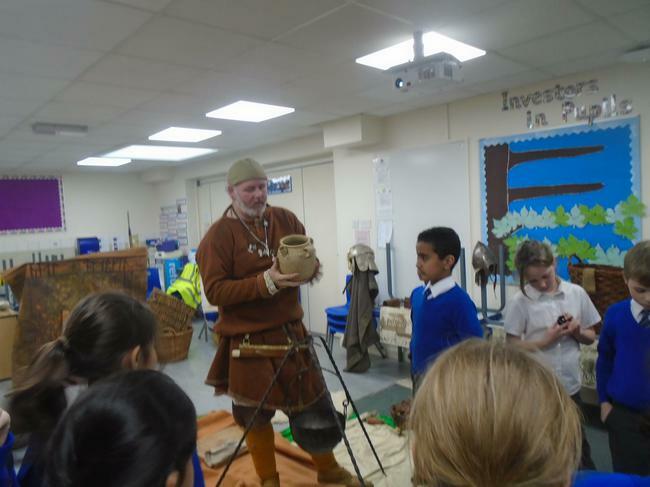 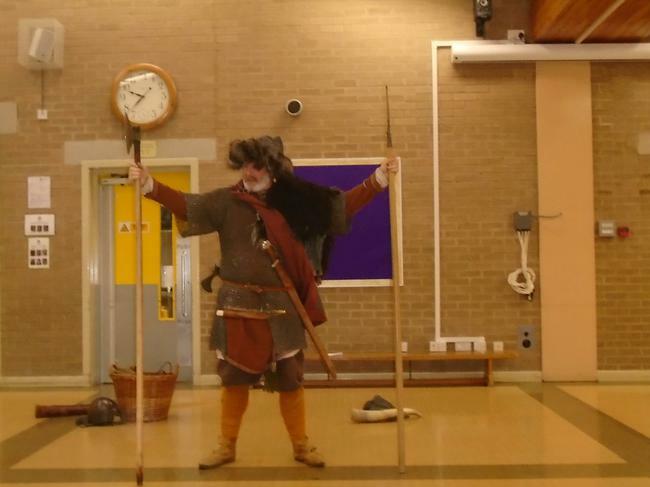 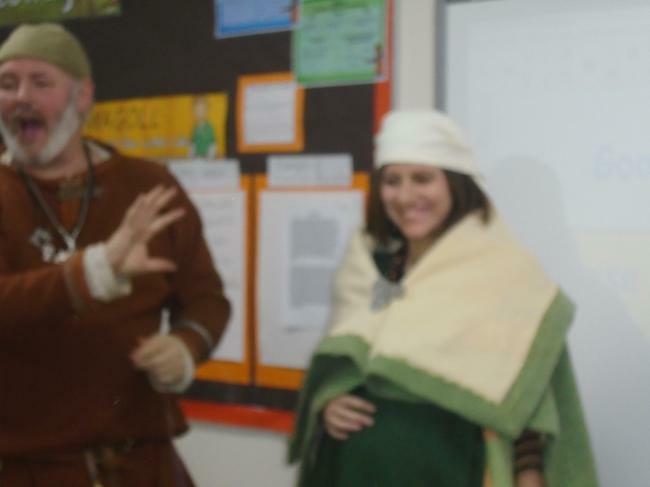 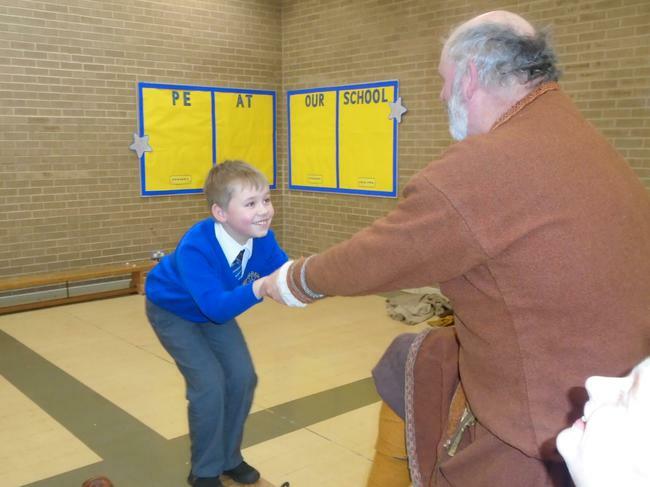 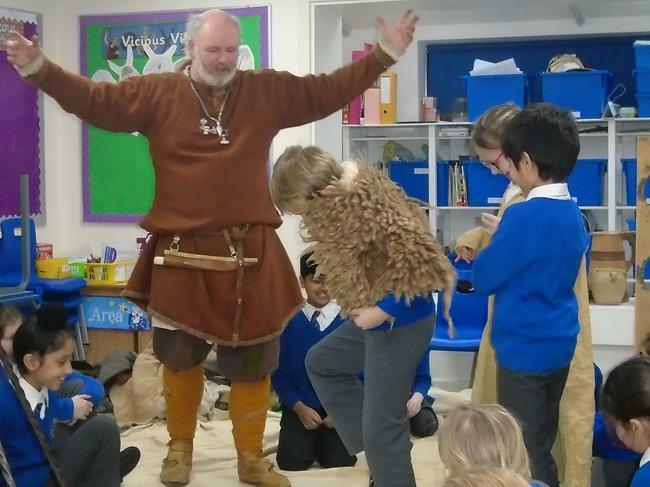 Information about this half term - The Vikings are Coming! 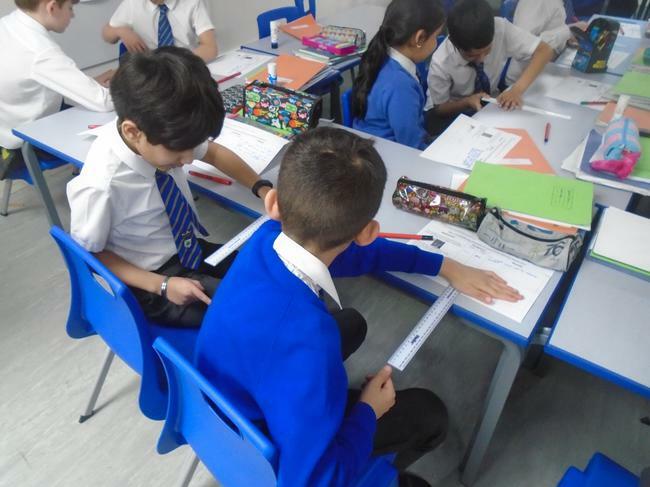 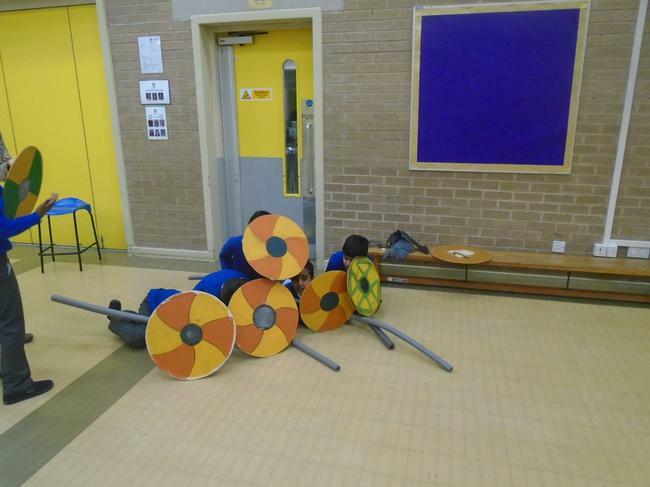 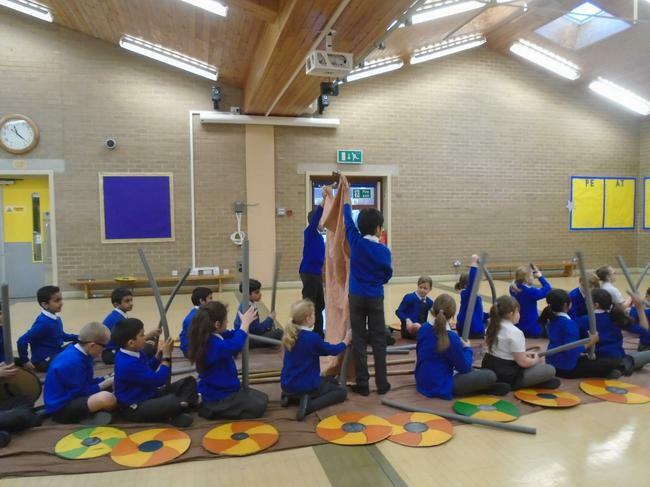 Year 4 have been multi - tasking this week making Viking shields as well as researching and sketching ideas in order to make their Viking long boat. 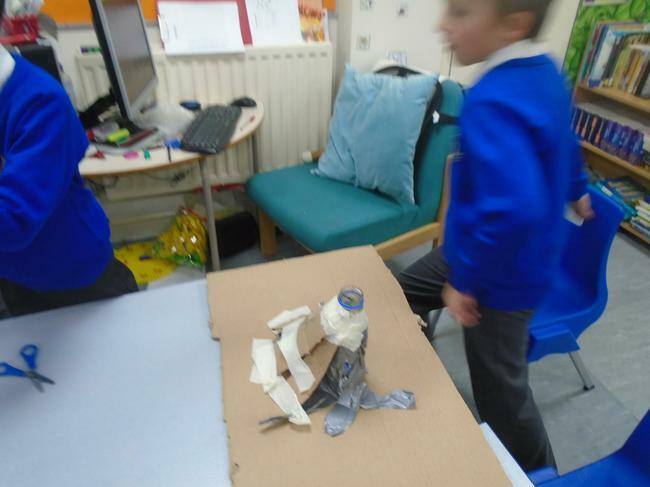 I'm sure you'll agree they're very creative! 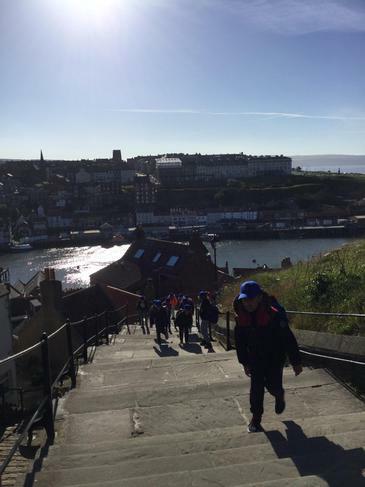 Year 4 loved their first try on the trim trail! 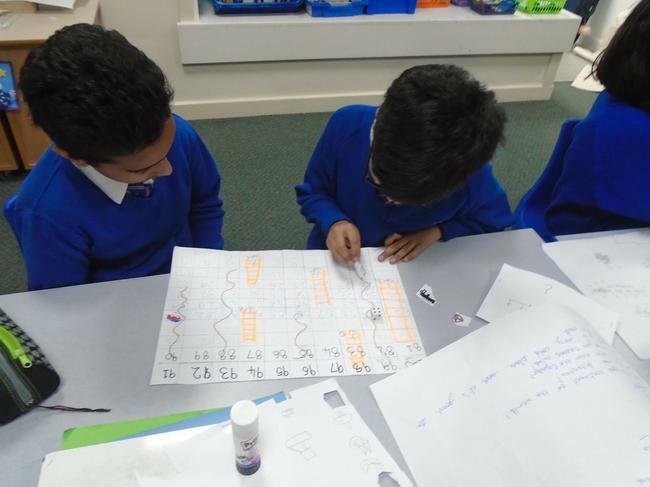 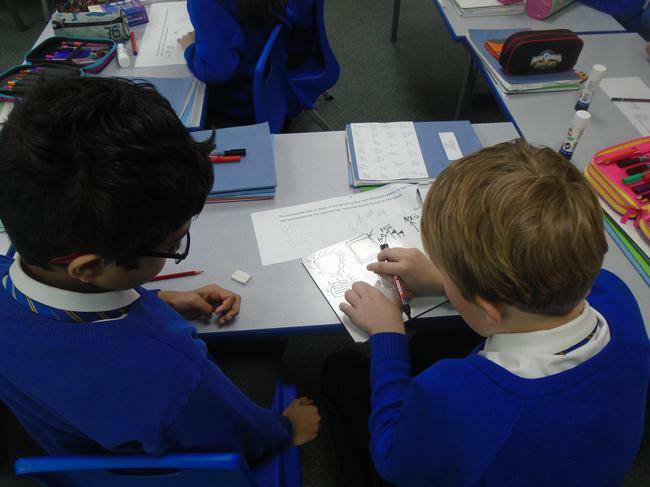 Year 4 thoroughly enjoyed their problem solving lesson and can't wait to have another go! 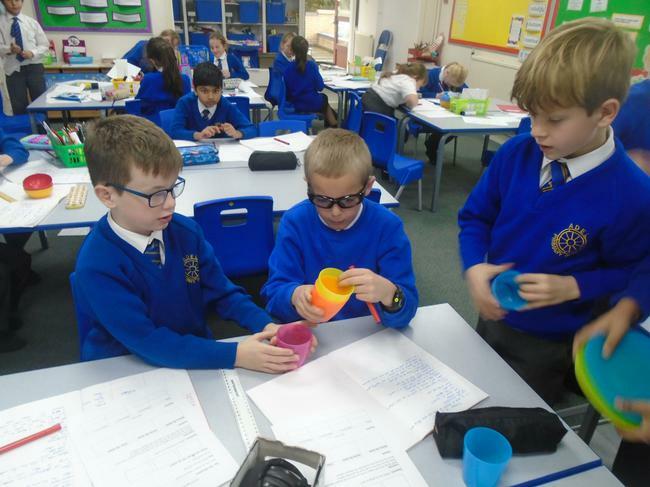 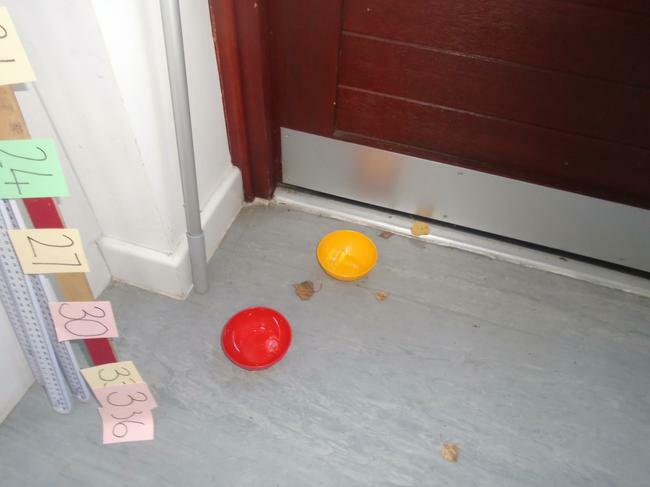 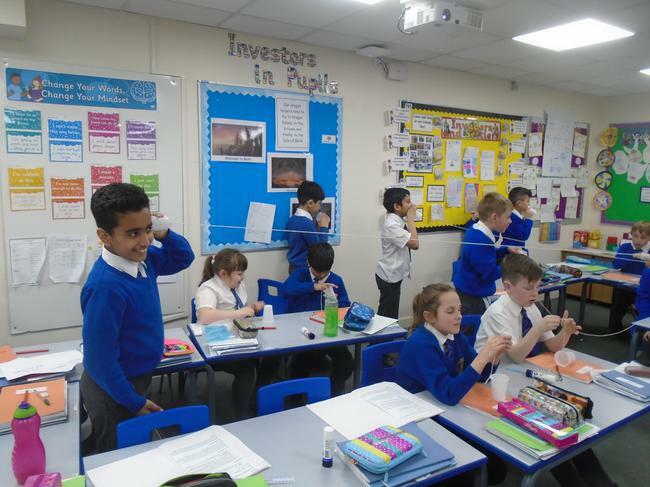 Year 4 tested different objects to see if they were conductors or insulators - they were surprised by some of the results! 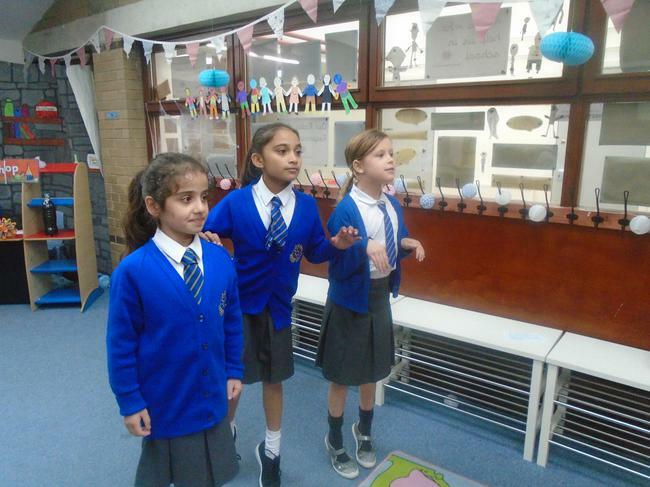 Our next step is to add animals that we've drawn and painted and hang them from the ceiling! 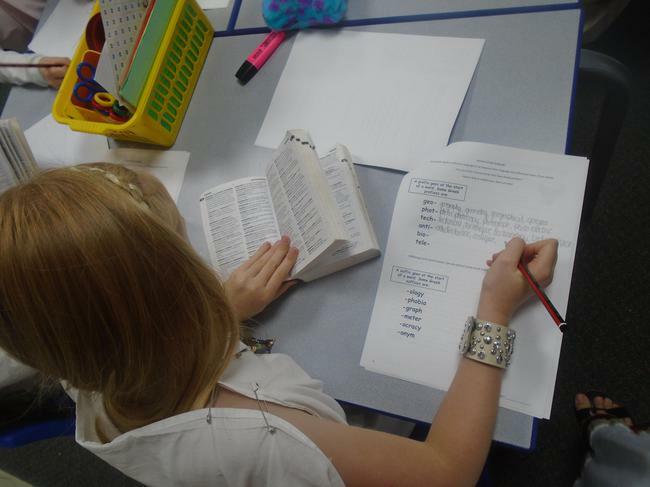 Next week, children will choose one of their descriptions to edit and improve. 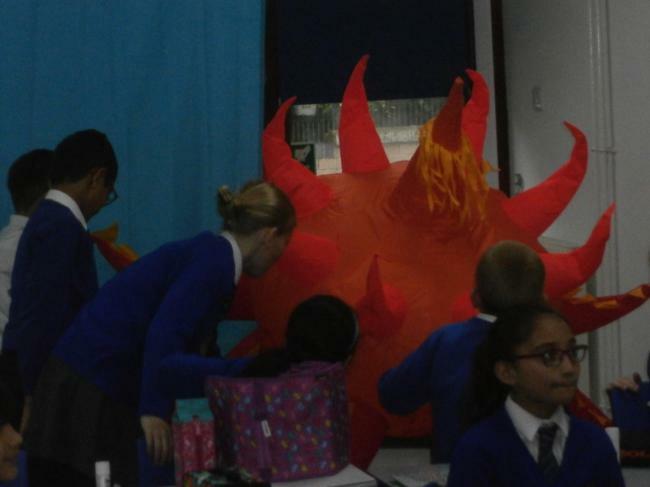 Then they'll produce a final draft. 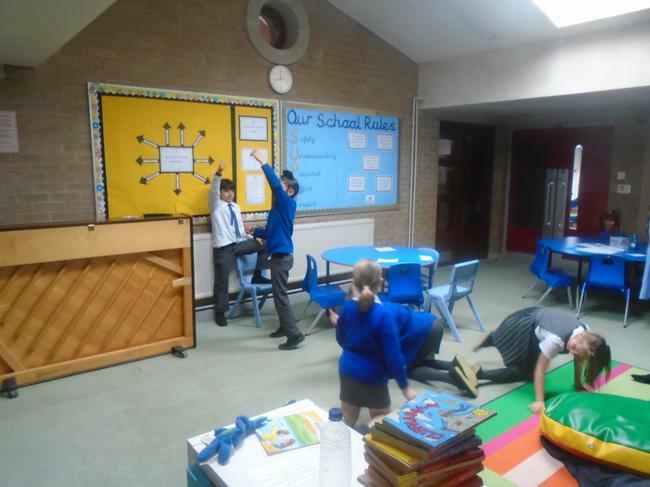 Watch this space as I'm going to upload some my favourite written pieces! 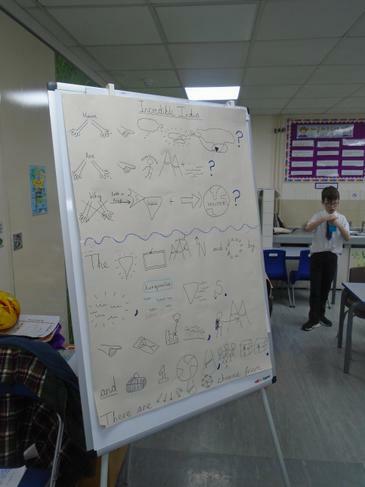 Here are some rough drafts so far. 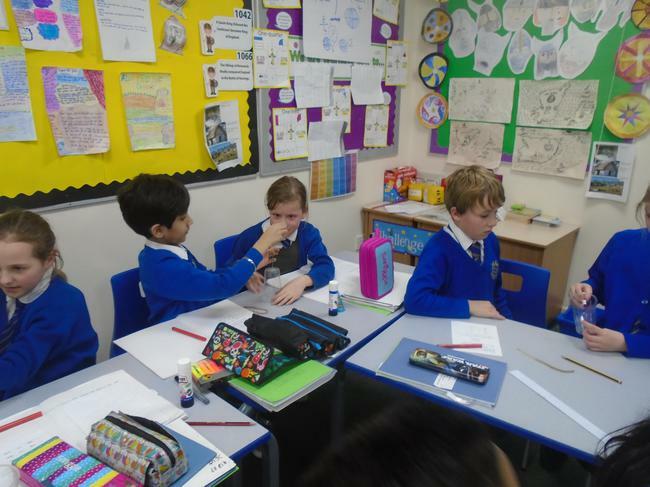 In Art this week, Year 4 learnt how to correctly sketch a portrait of a face focusing on using accurate proportions. 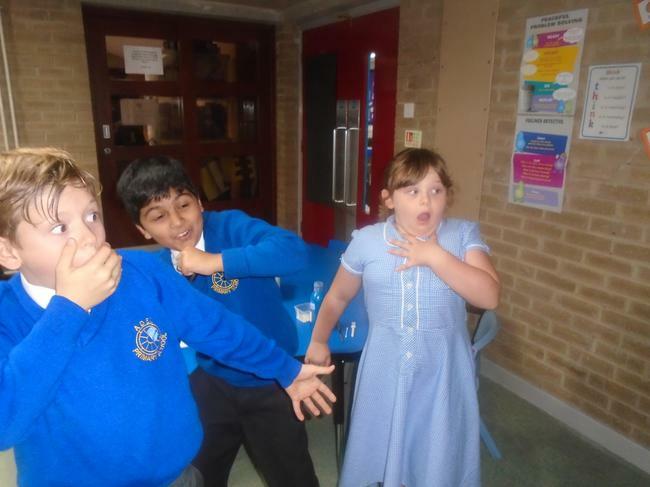 Here is one of my favourites so far! 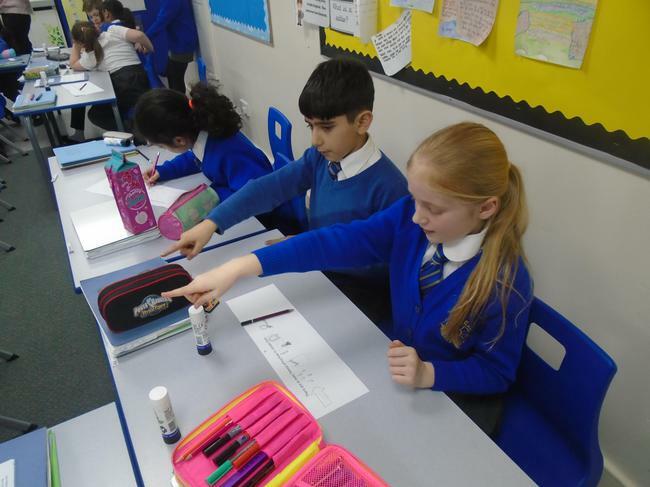 We're trying to improve our spellings! 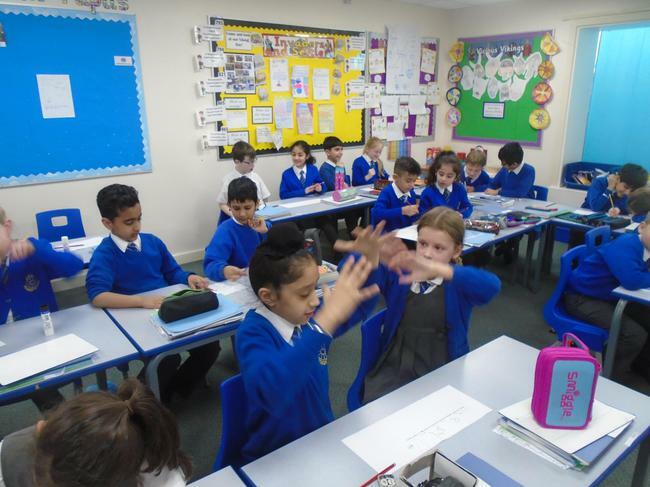 This week, we've been trying to improve our spellings by playing 'Word ships'. 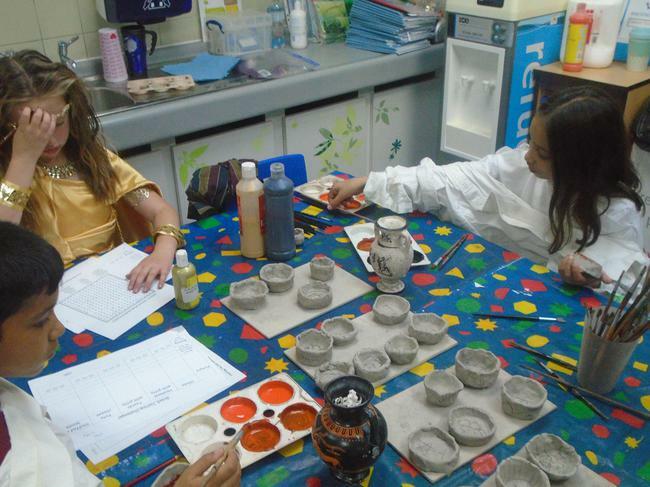 Children have focused on words with the 'sc' family such as: fascinate, scenery and scientist. 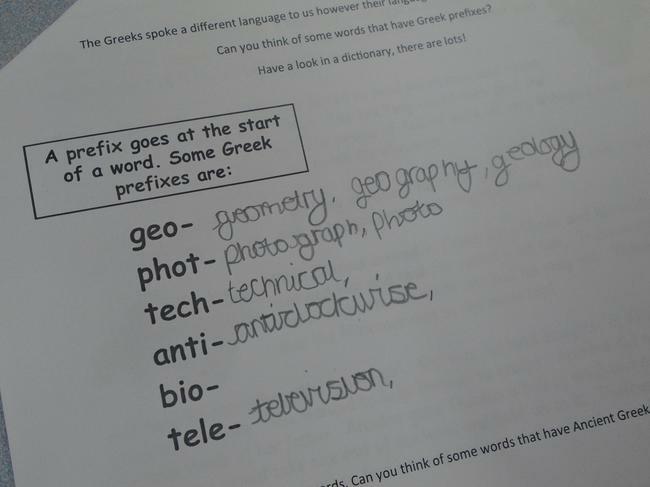 Hopefully, they'll get their spellings correct next week! 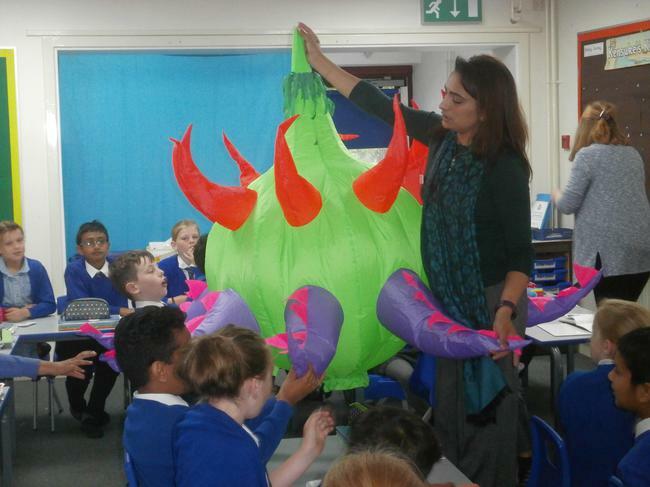 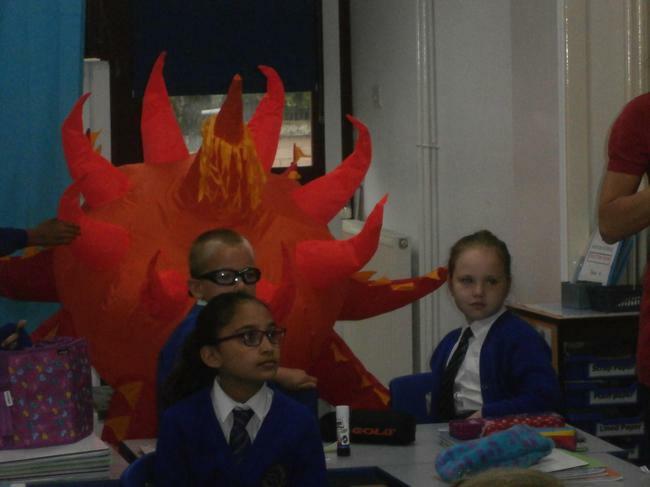 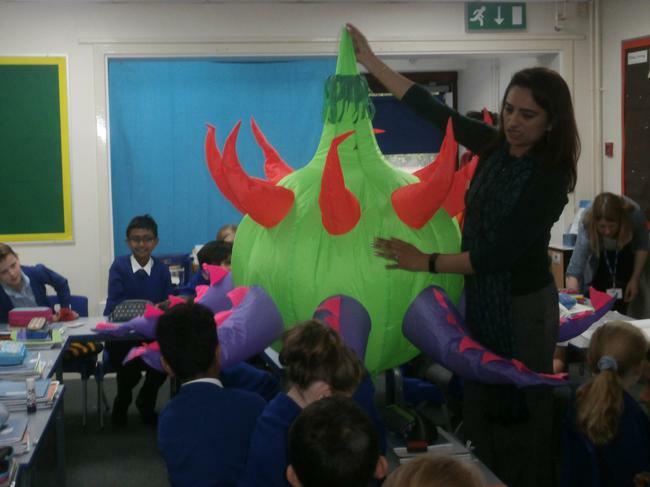 This half term, children will be learning about volcanoes and other natural disasters. 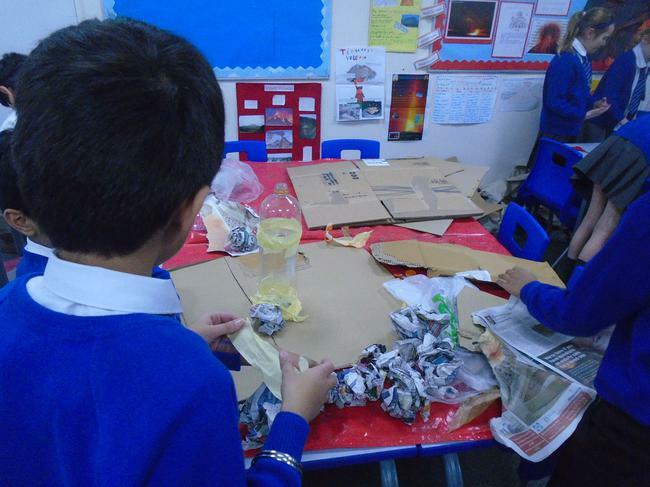 They'll be making erupting 3D volcanoes, writing shape poems and even become journalists reporting on the disaster at Pompeii. 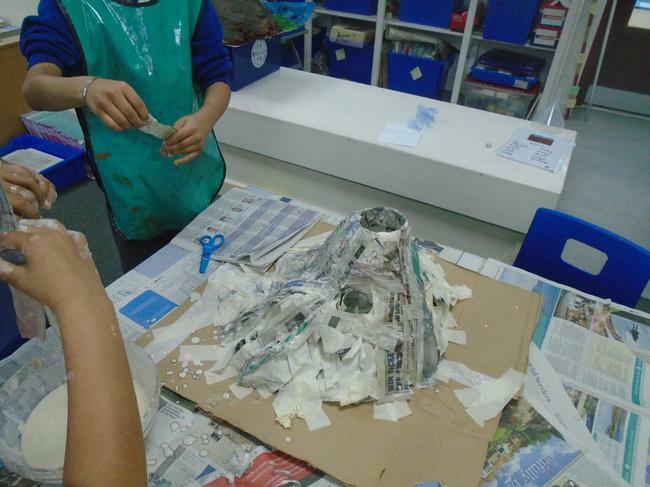 Over the holidays, Year 4 worked really hard on their volcano project. 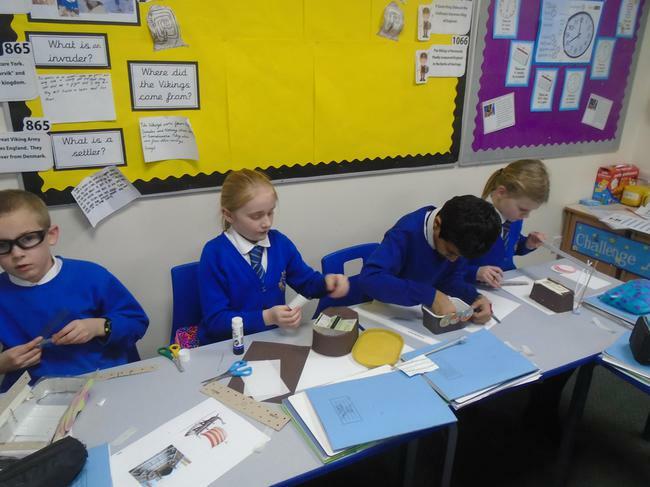 Here are some examples of their work displayed in class. 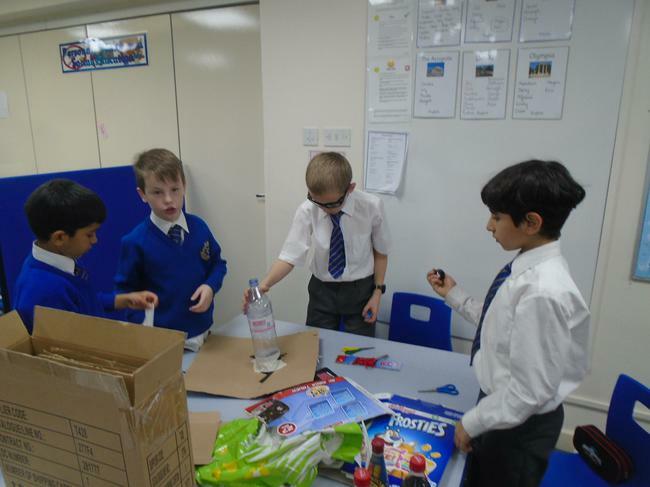 Christmas is fast approaching and we needed to start preparing for our Christmas Fayre. 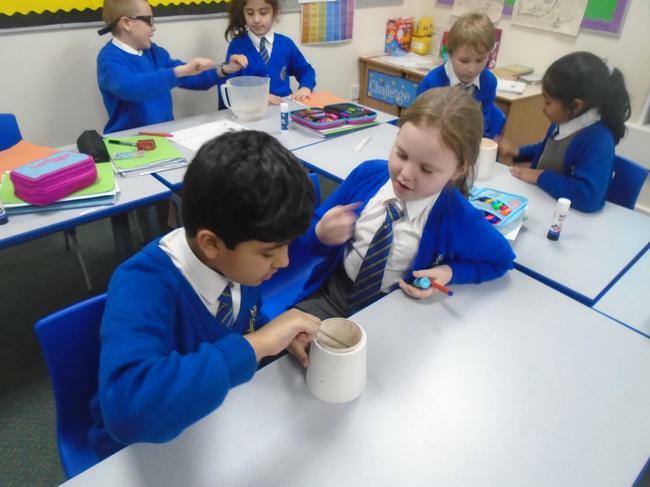 We made delicious 'Hot Chocolate Reindeers' and hope to sell them for £1.00. 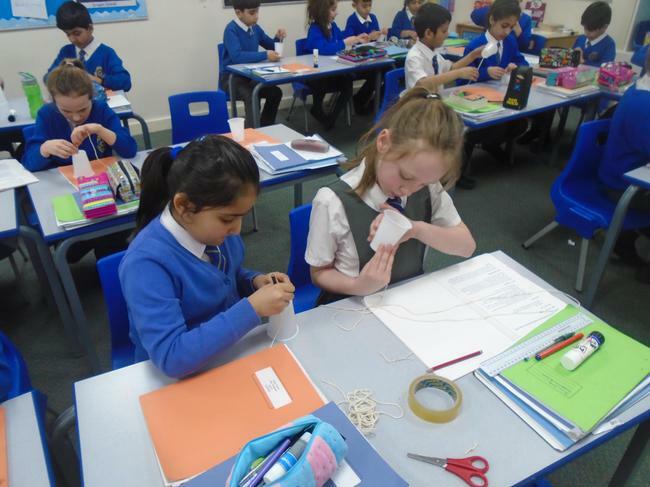 In our Literacy lessons, we're also going to write a set of instructions explaining how we made them. 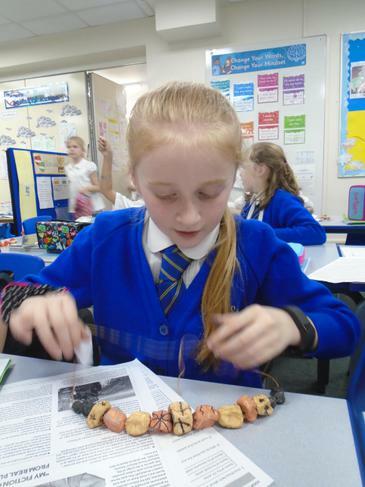 I think they'll sell fast so come to our stall as quick as you can! 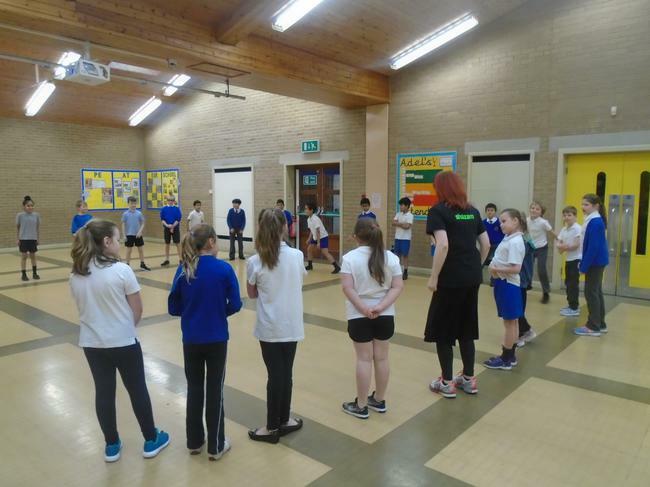 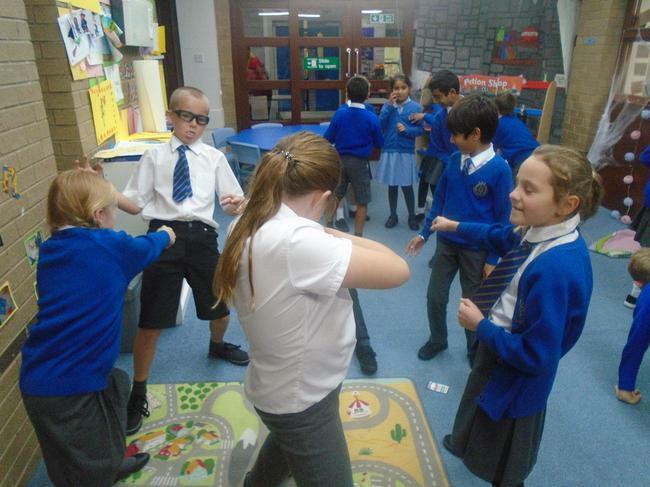 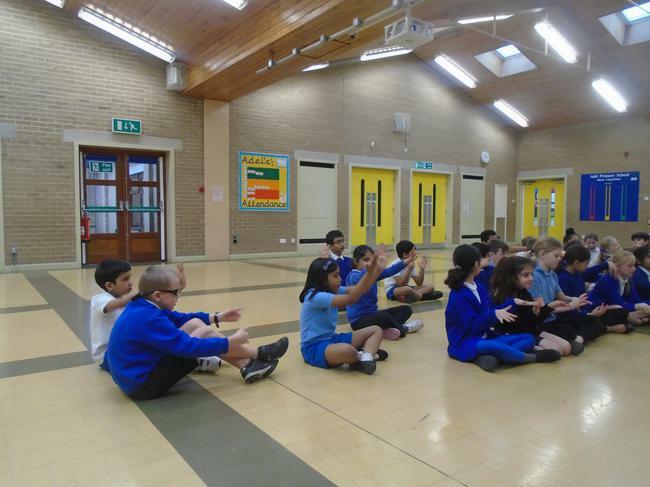 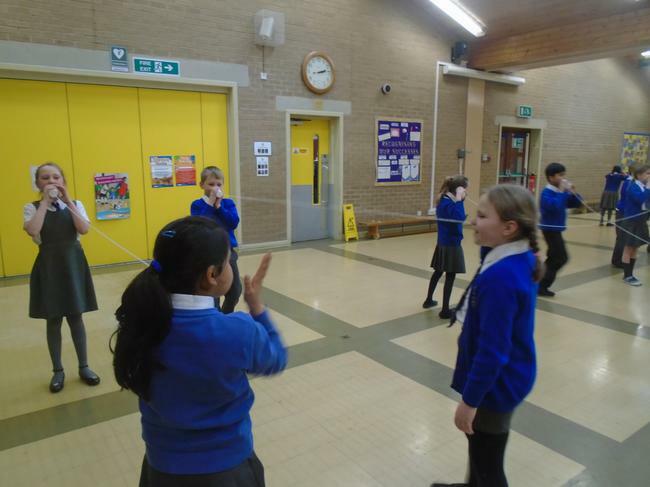 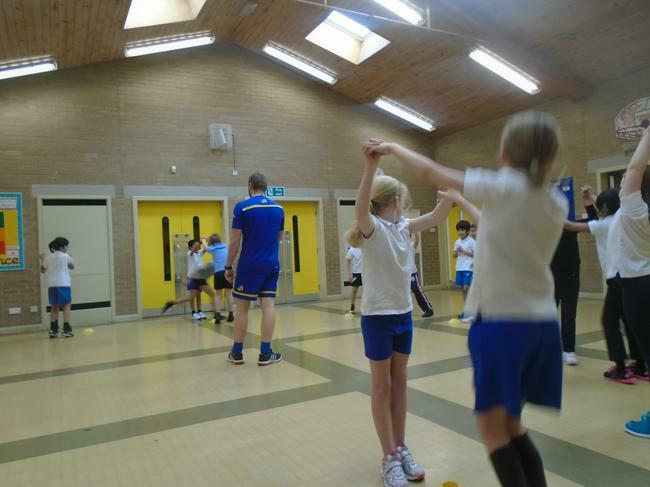 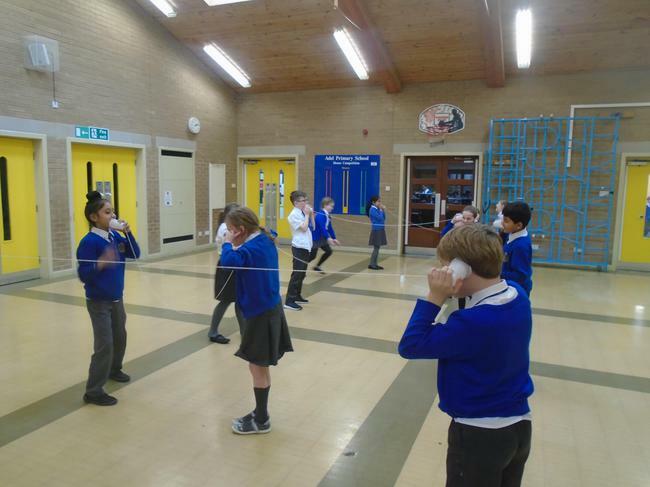 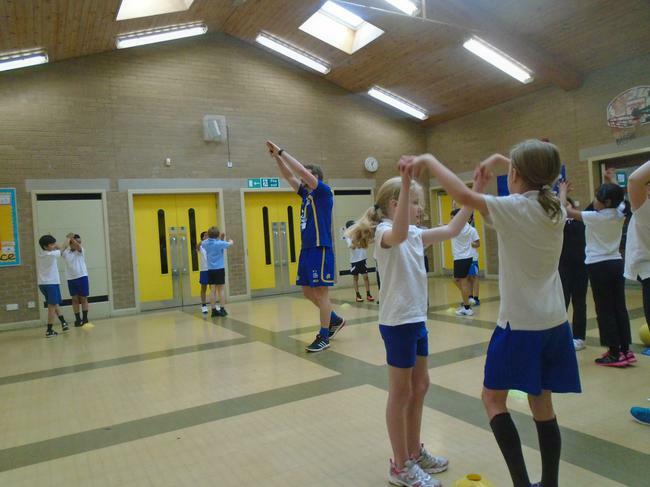 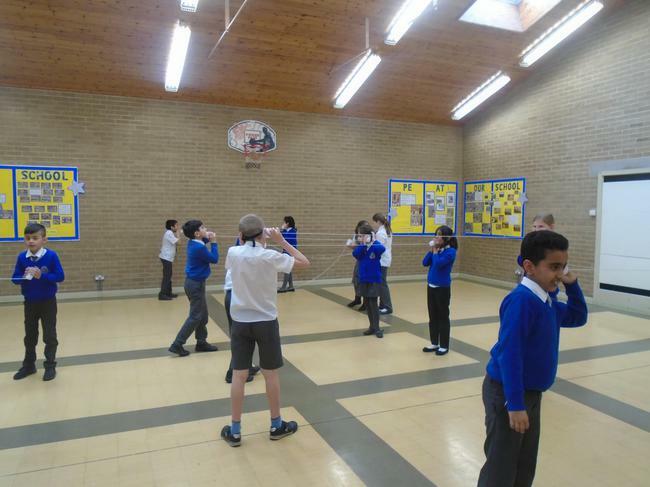 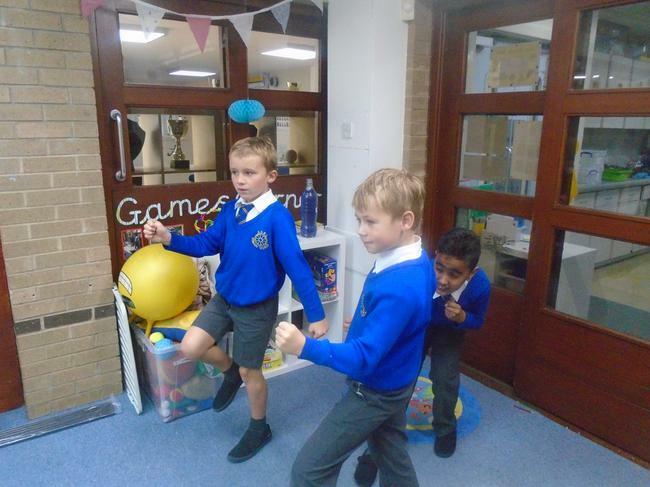 In P.E, last week, Year 4 had a fun, active lesson playing a game called 'Dice Frenzy'. 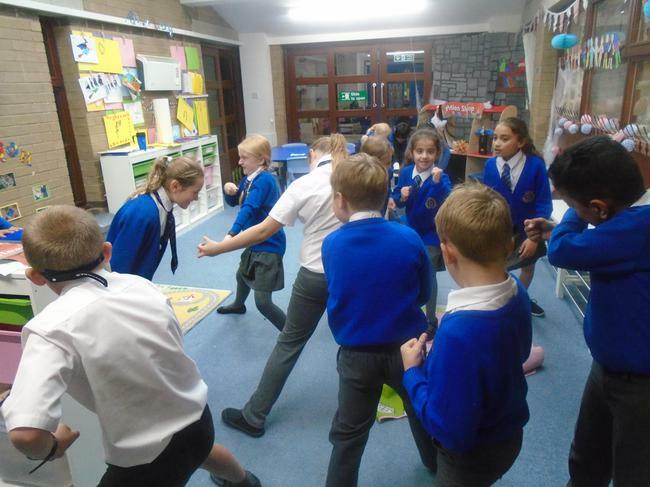 Children had to work in teams to think of six high intensity activities. 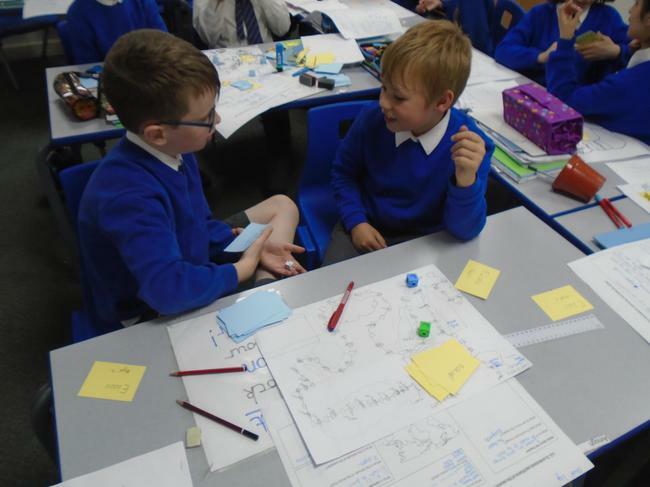 They then had to roll the dice and complete the activities. 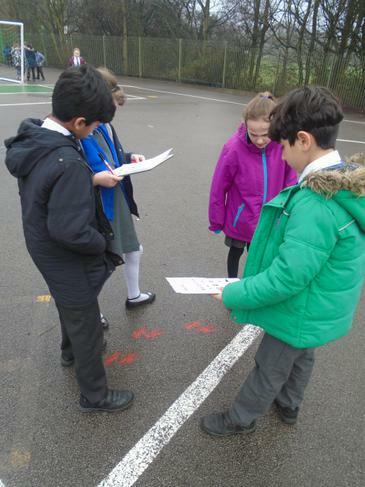 The team to roll all six numbers were the winners! 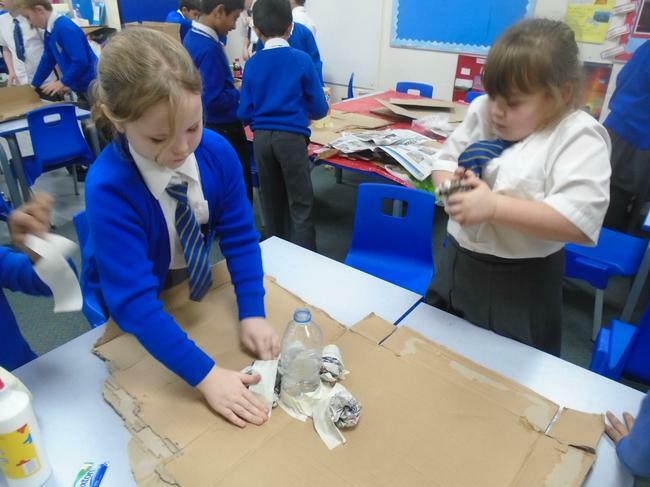 The children were so excited making their models! 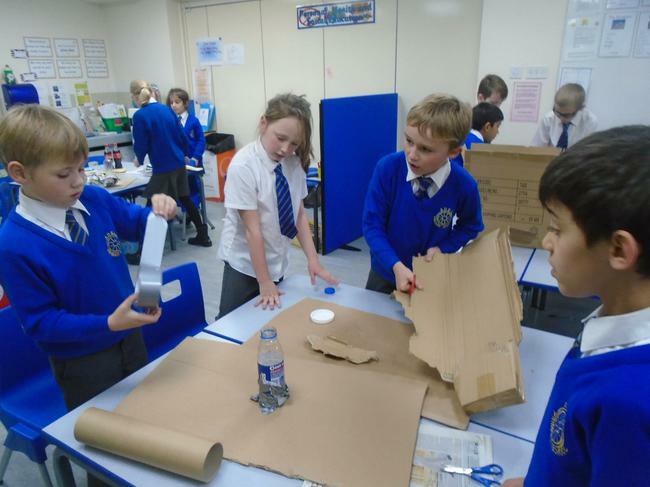 They brought in all their equipment and followed their plans. 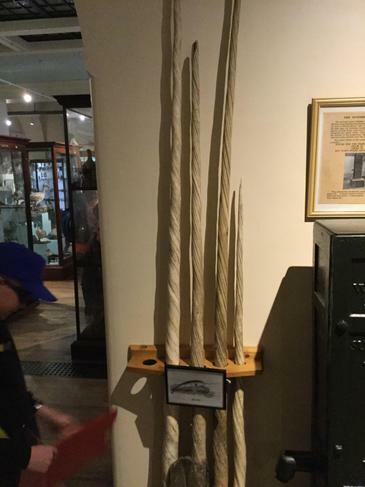 They did make changes along the way if they thought it could be improved in some way. 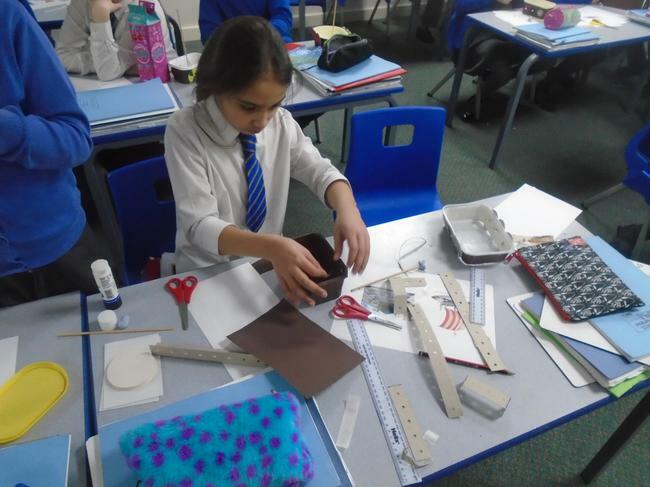 Some children in Year 4 have been making 3D models this week finding properties such as: faces, edges and vertices. 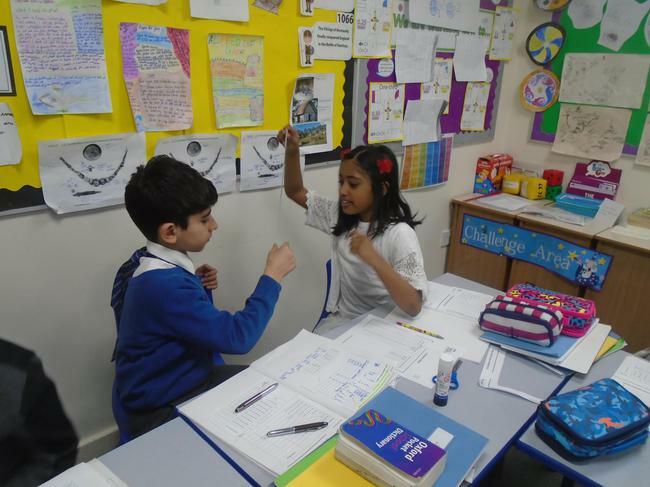 As part of our newspaper recounts, we've been trying to use more ambitious conjunctions to extend our writing. 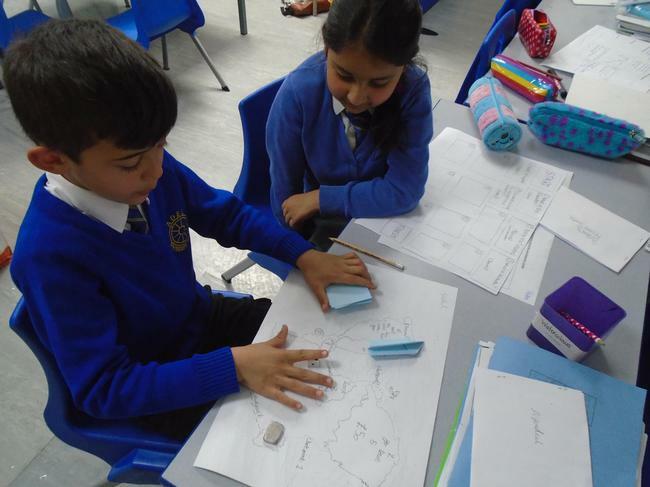 In our geography lessons, we've been learning all about tectonic plates and we now know they look like huge jigsaw pieces! 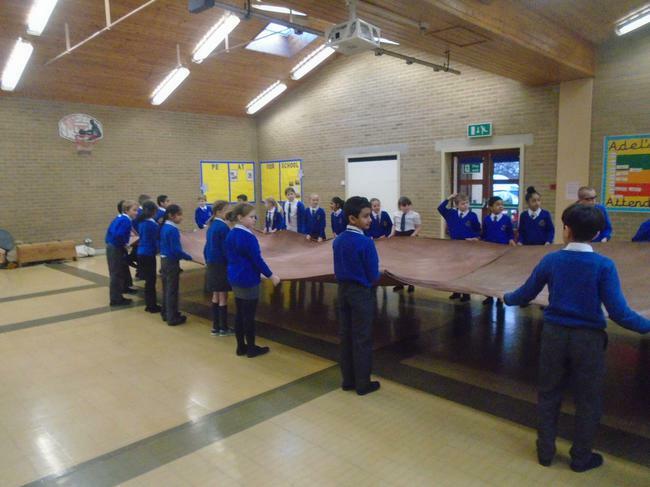 So today, we made a jigsaw puzzle putting the tectonic plates back together, we used an atlas to help us put it back together! 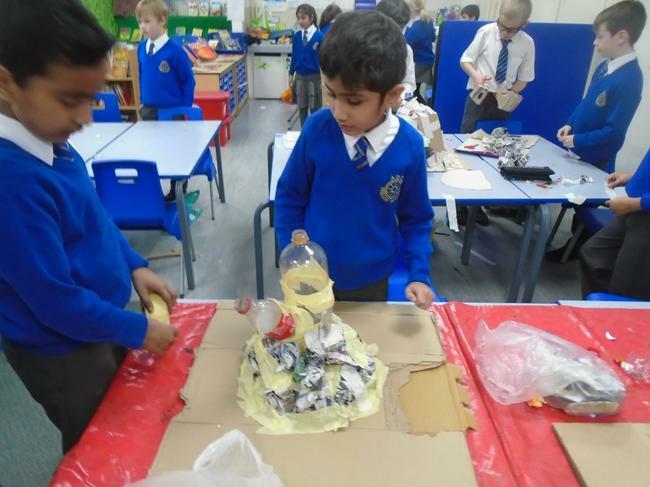 We're going to make an erupting volcano! 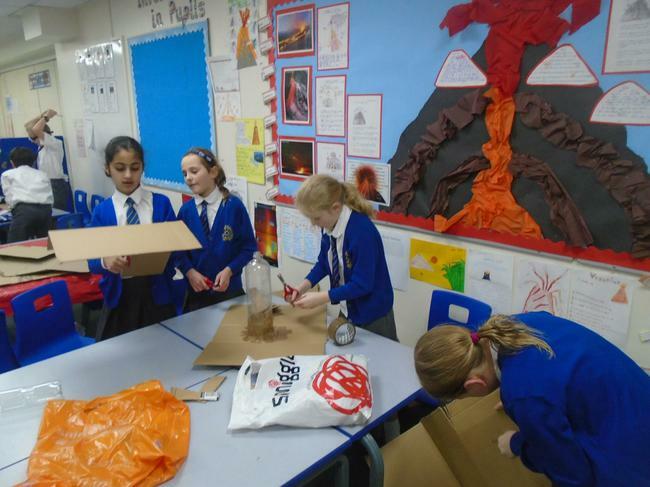 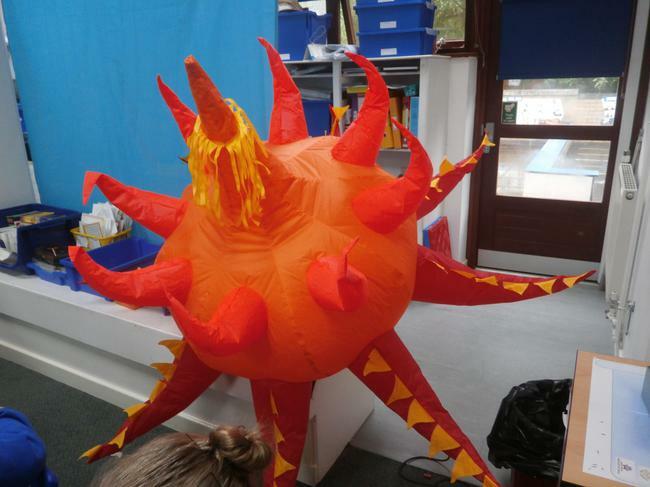 In our design and technology lessons this half term, we're going to make an erupting volcano. 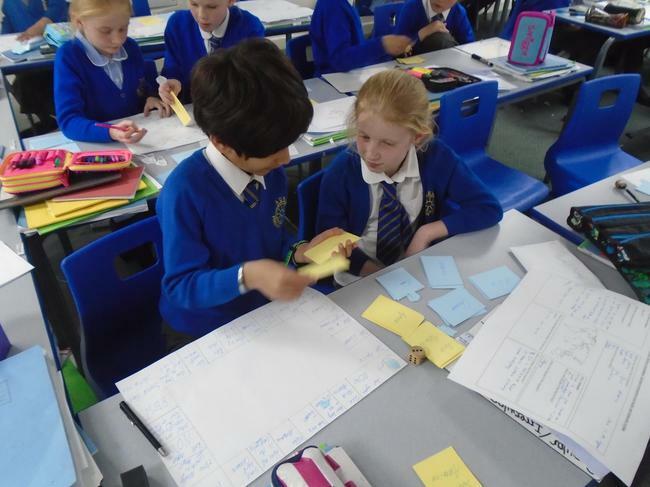 Today we began to research ideas of how to make them. 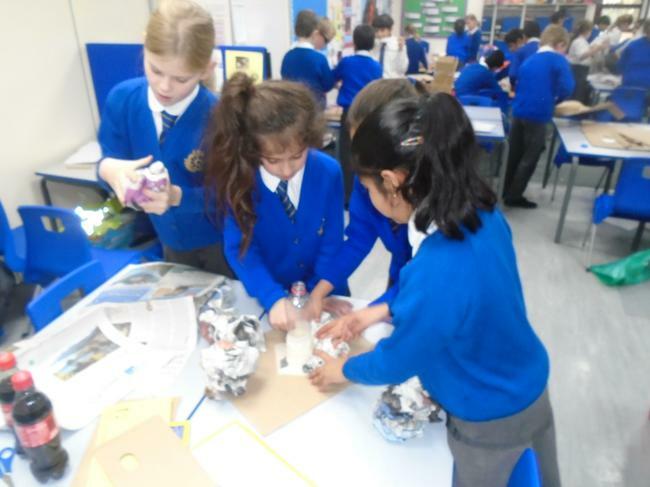 Then children worked in groups deciding the method in which they would make their volcano, which materials they would use and finally what they want their volcano to look like. 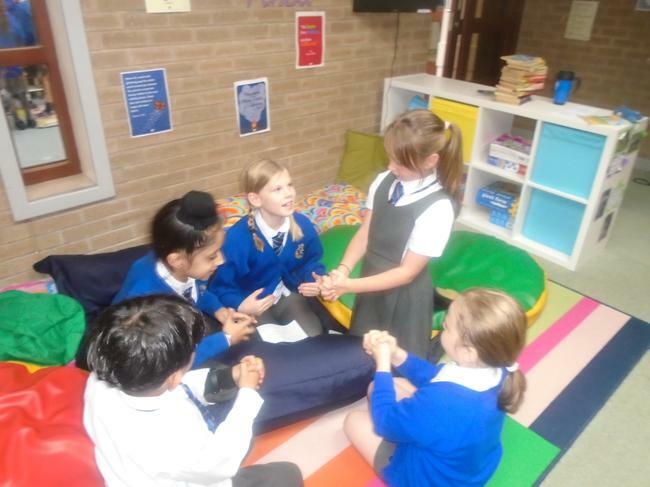 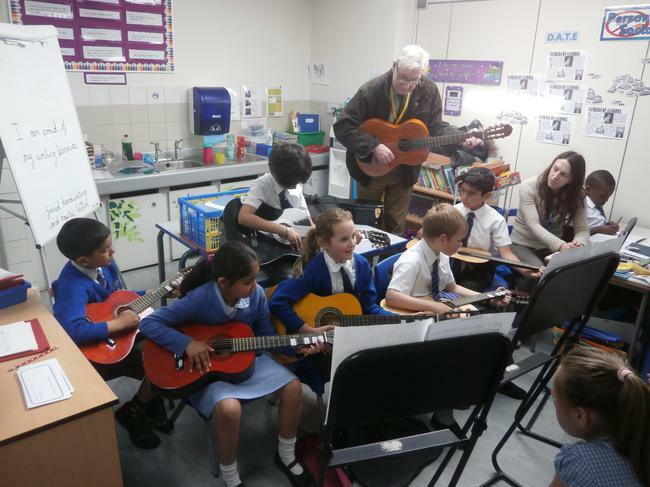 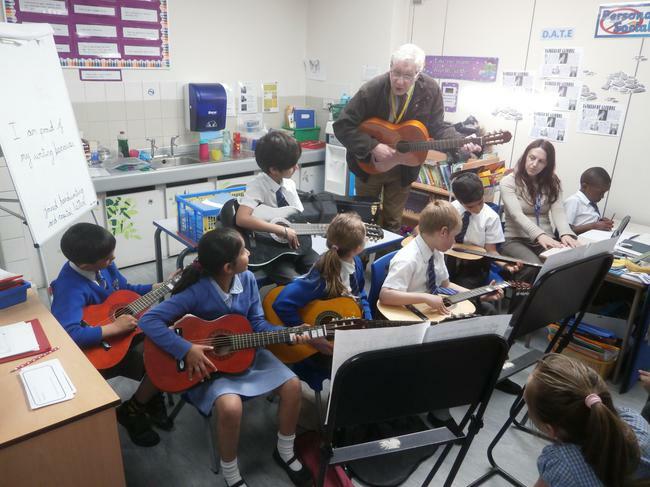 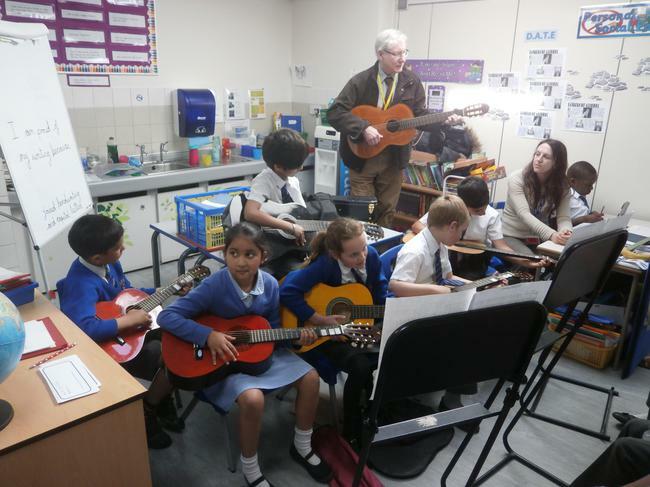 Watch this space to see how Year 4 get on! 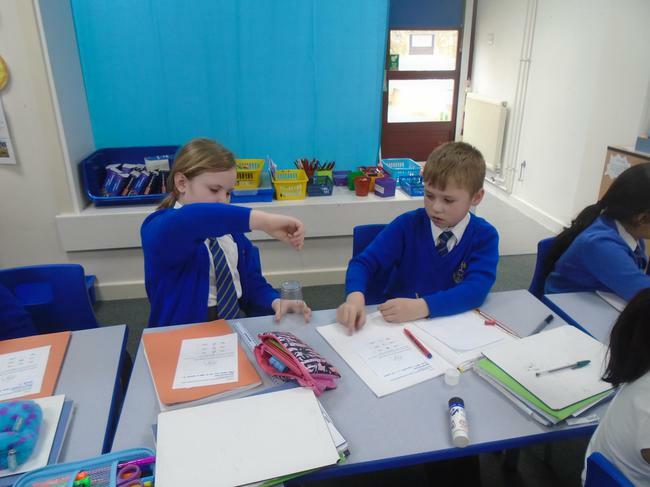 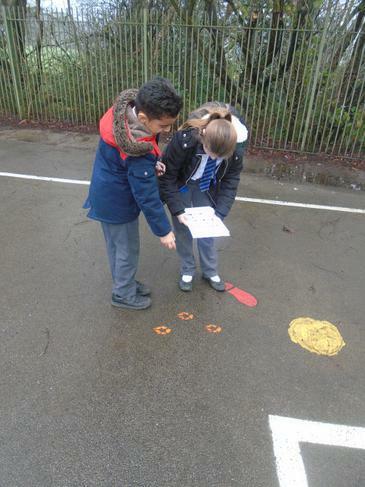 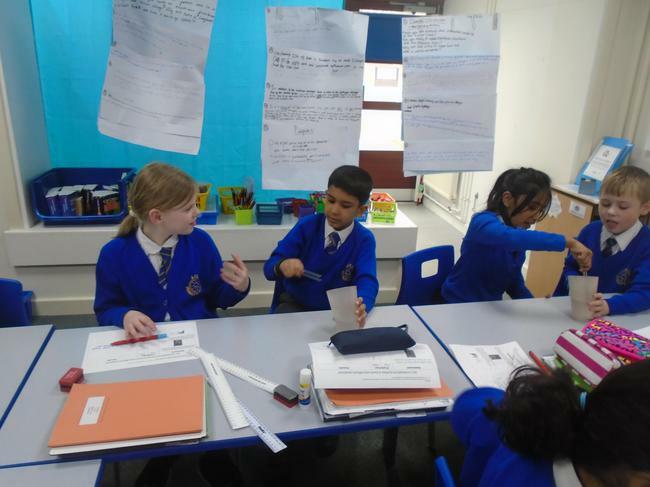 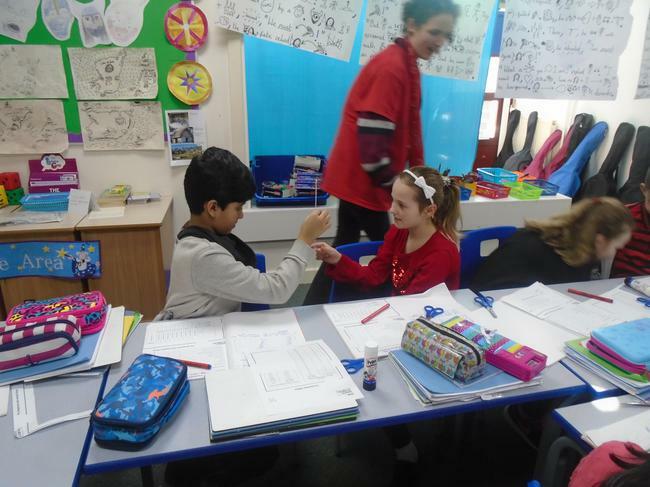 In science, children worked in pairs to complete an experiment focusing the rate of ice cubes melting in different places in the classroom. 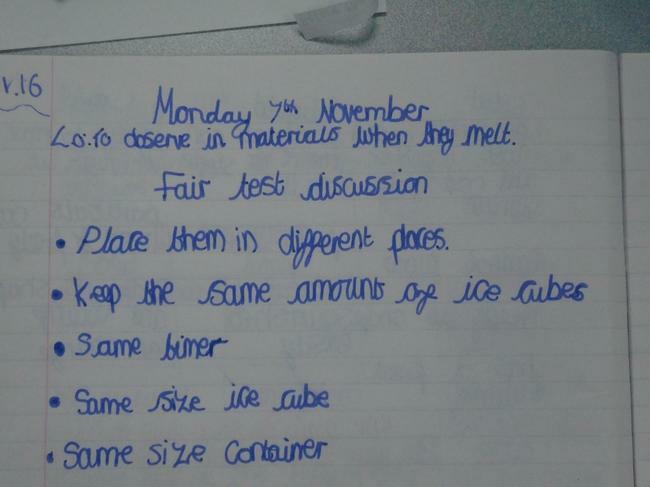 We worked as a class to discuss how we could make it a fair test and came up with predictions of which ice cube would melt the quickest/slowest and gave reasons why. 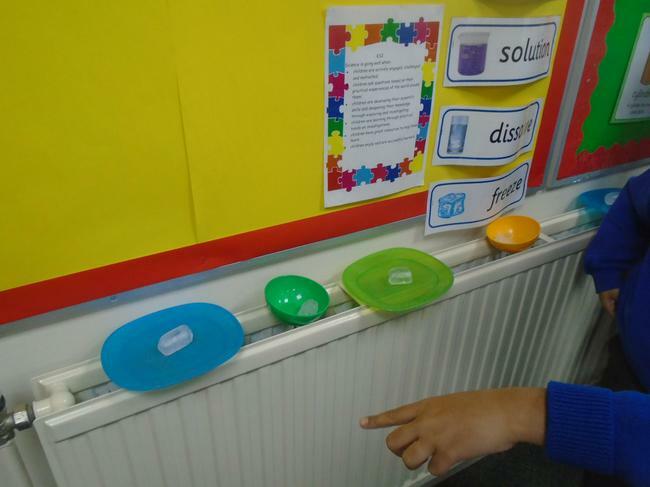 One child said, "If we put it near the radiator, it will melt quicker due to the heat." 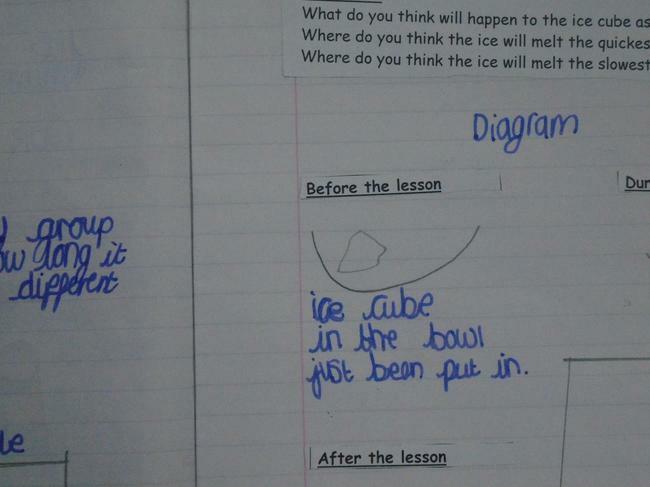 Another said, "The ice-cubes will melt the slowest if we put it near the outside door because it feels colder." 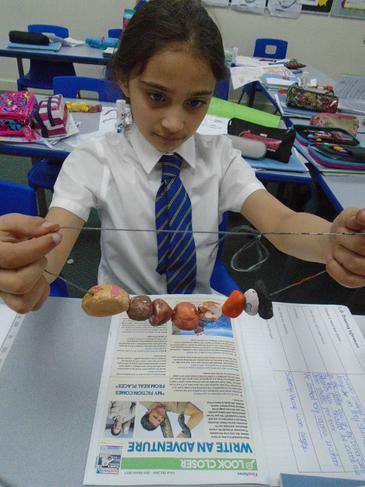 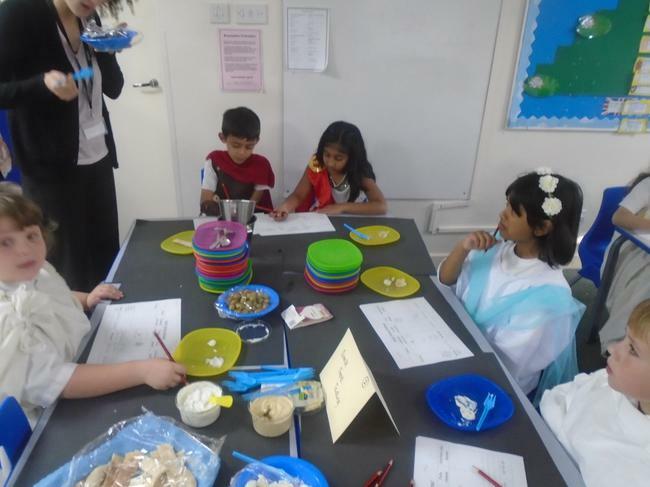 In Science, children will be learning about solids, liquids and gases. 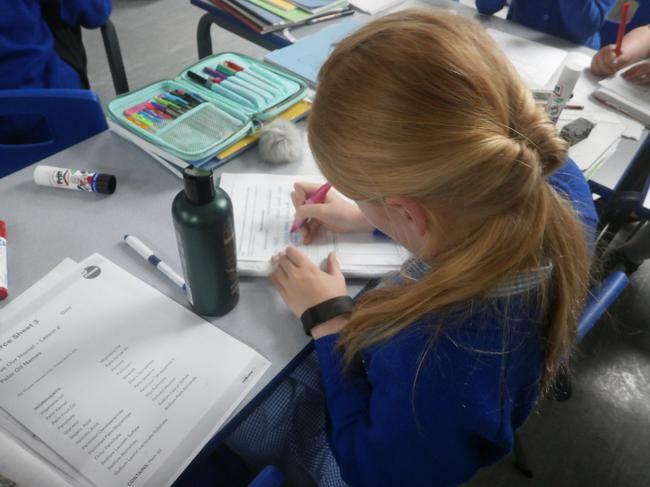 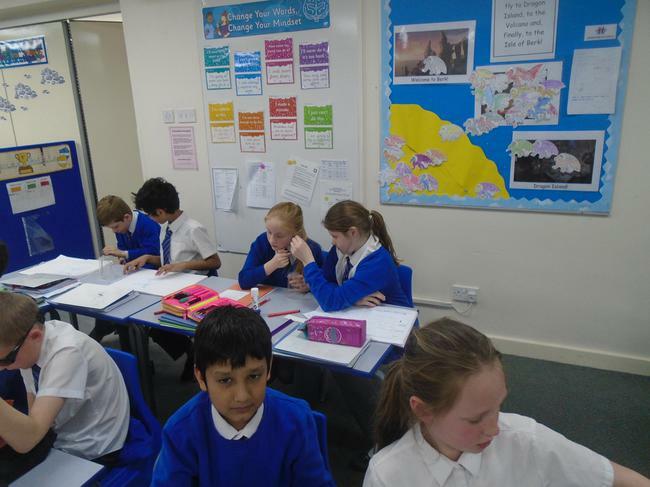 Yesterday, Year 4 focused on finding properties of each state. 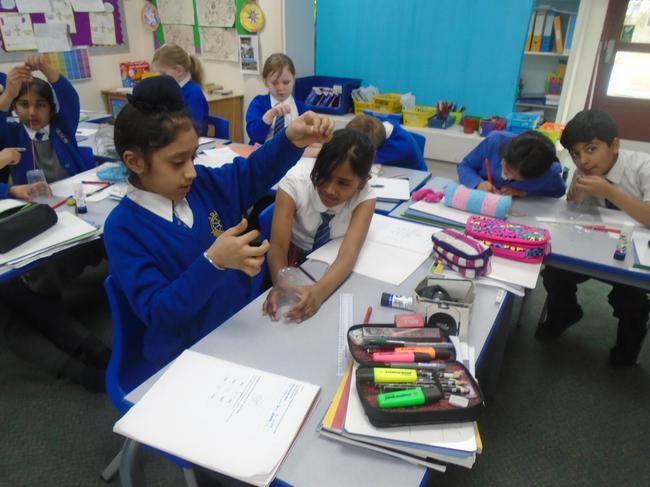 They also became particles practically showing the difference in each state. 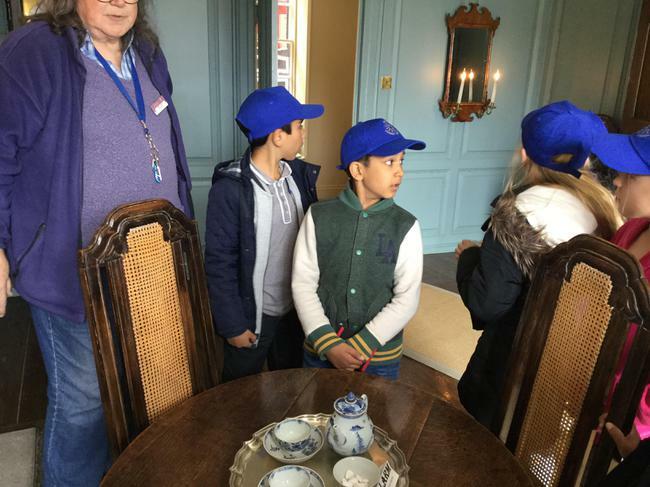 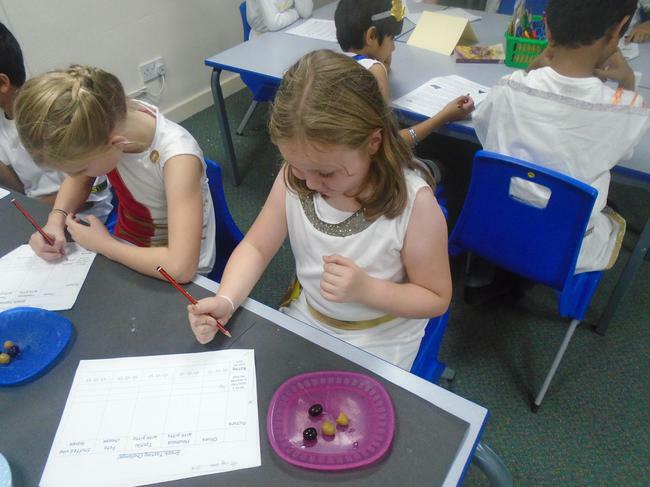 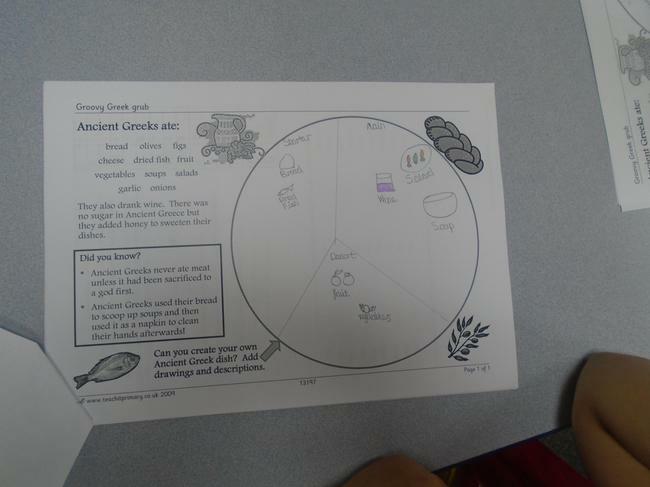 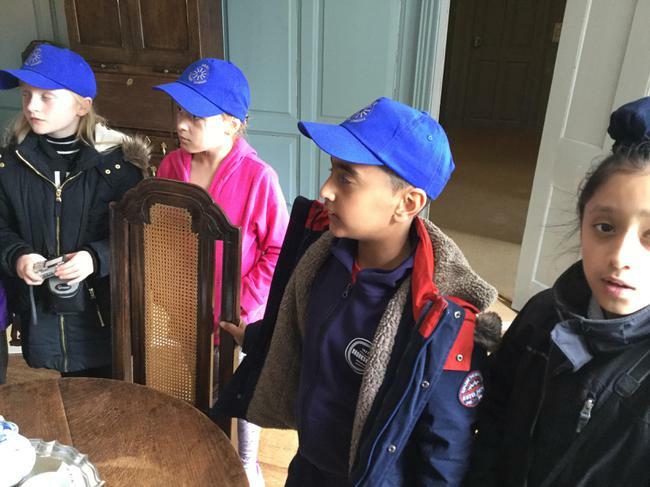 We've used Greek numbers, Greek words, painted Greek pottery and even tasted traditional Greek food! 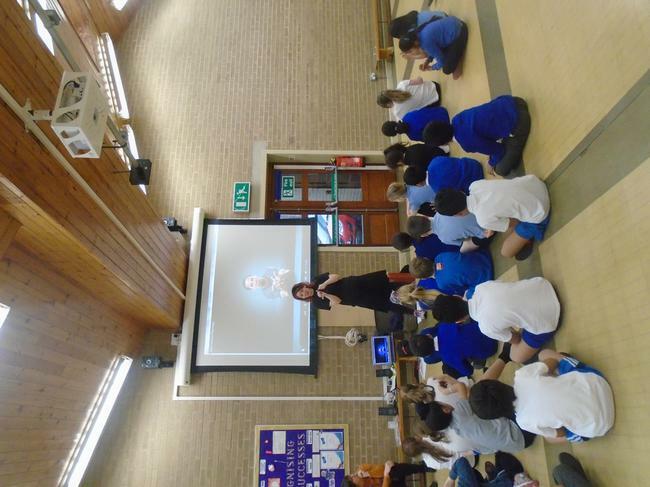 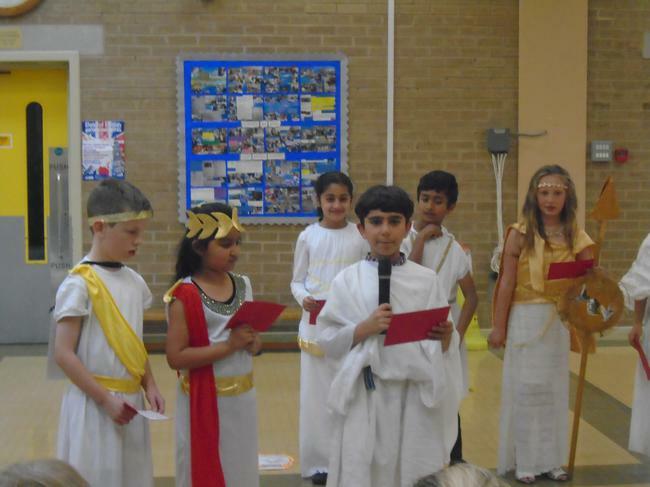 We finished our day with an assembly and parents were invited to come and watch. 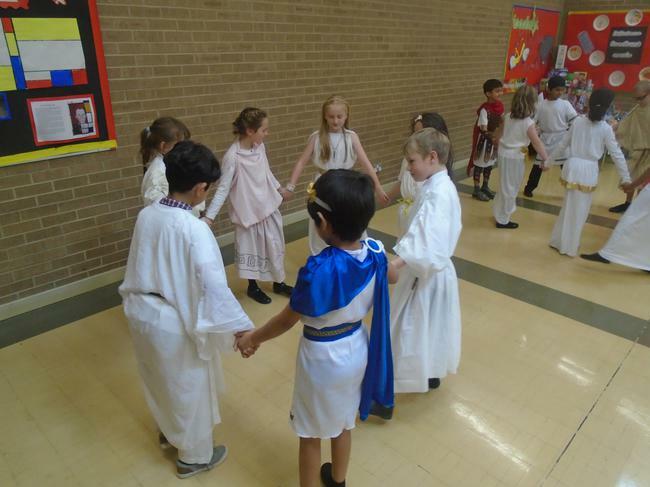 At the end of the assembly, we showed parents a traditional Greek dance and they even joined in! 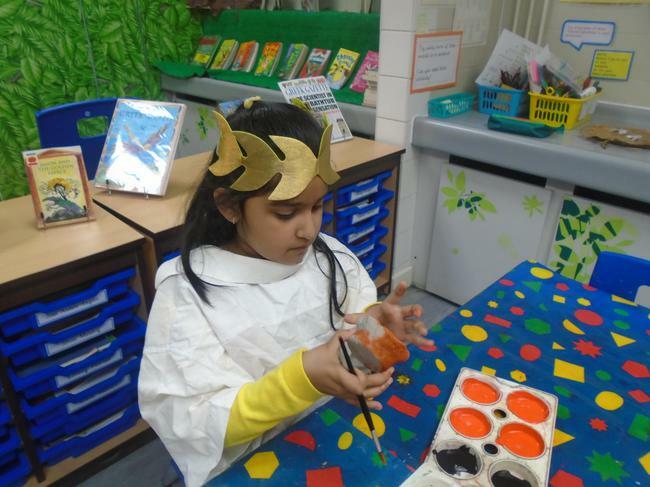 We loved making Ancient Greek pots this week and next week, we're going to paint them using traditional colours. 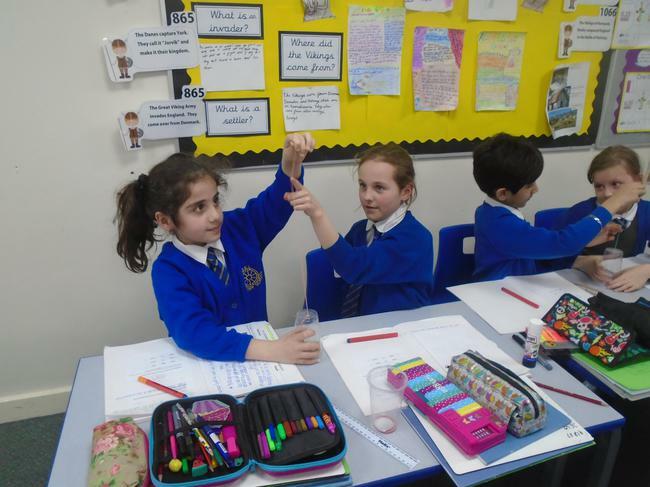 We have been learning about the importance of democracy. 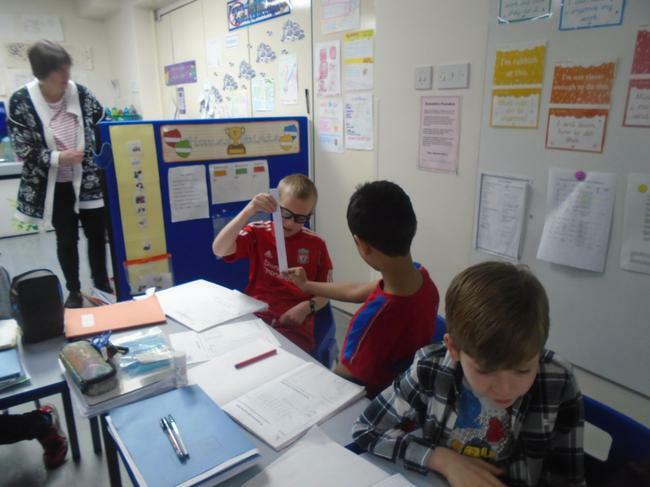 Factors, factors and more factors! 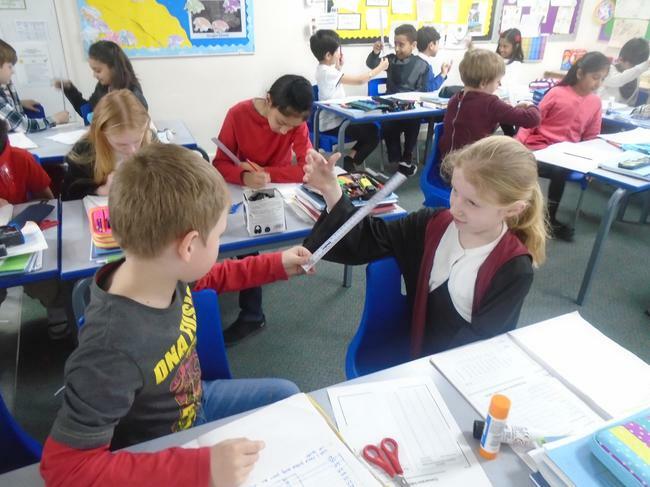 We made finding factors fun by creating factor rainbows. 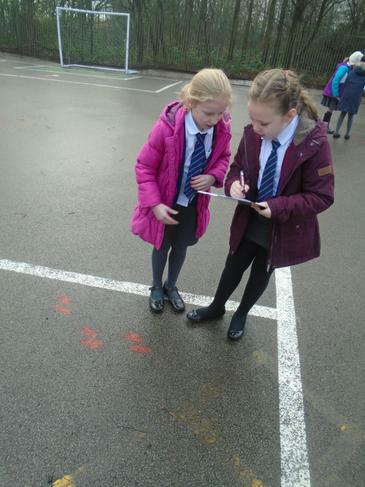 We know how to find the perimeter of shapes! 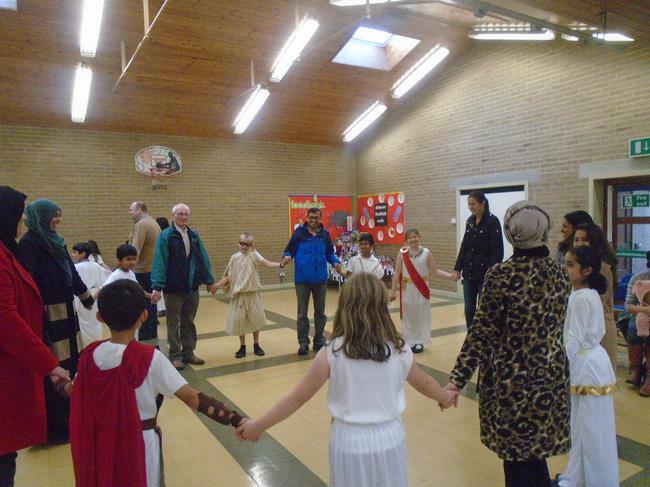 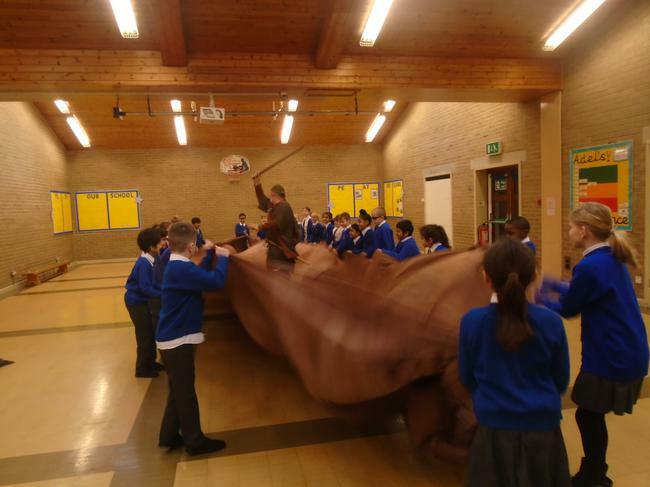 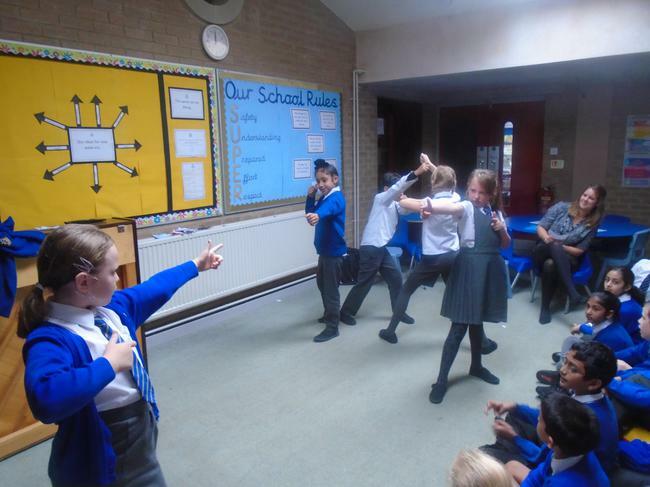 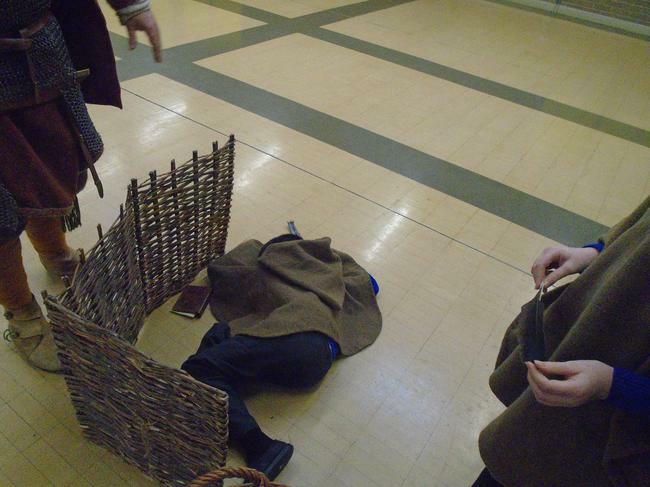 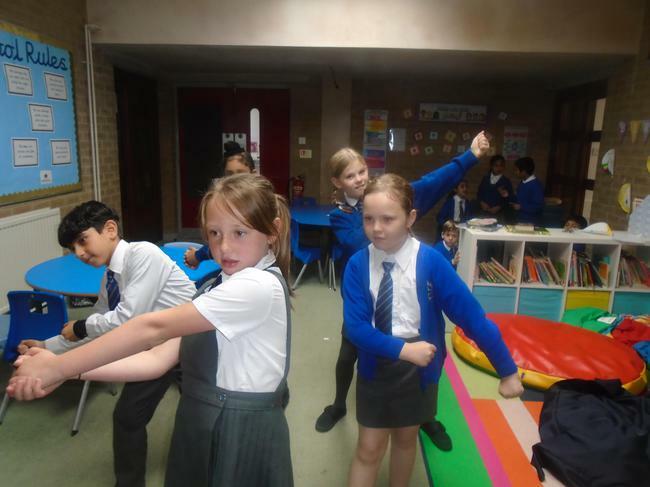 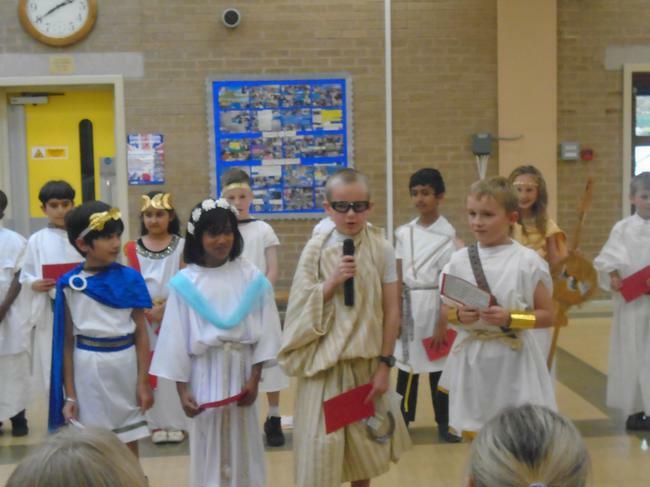 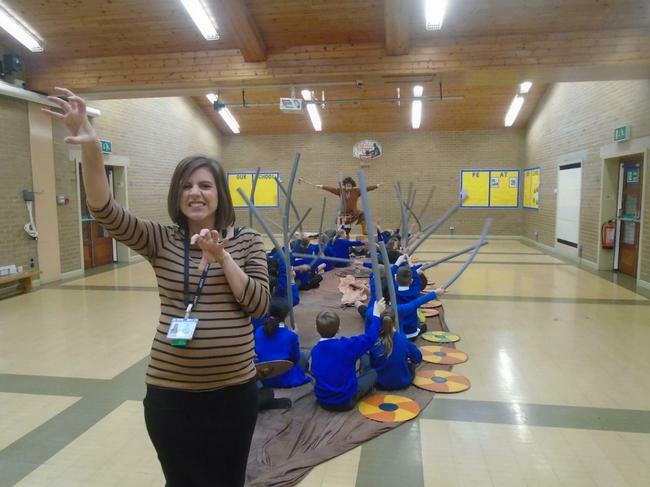 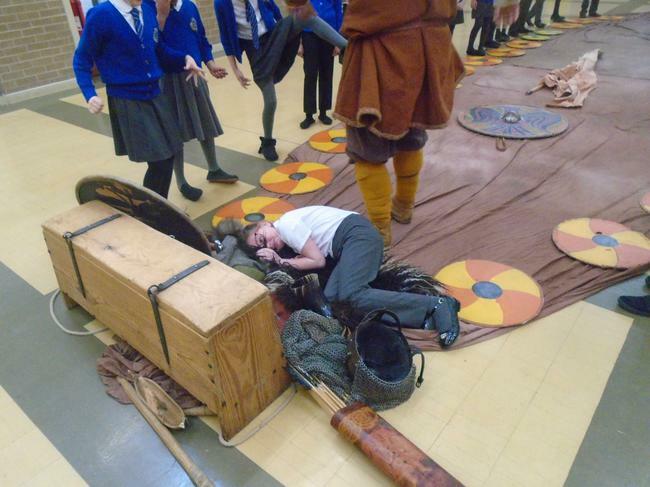 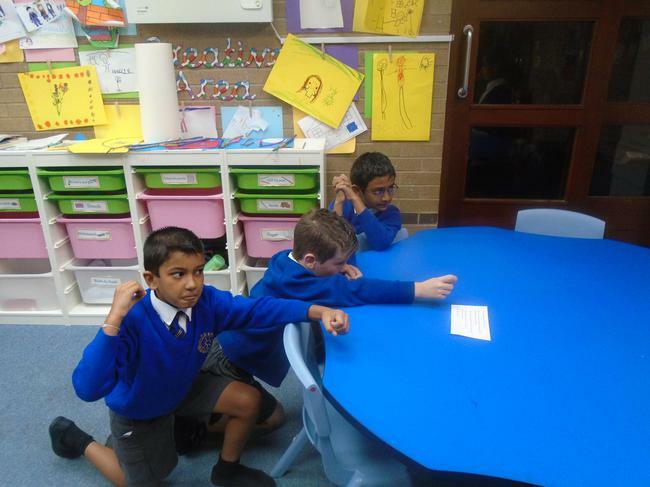 Year 4 thoroughly enjoyed themselves today learning about the Trojan War the drama. 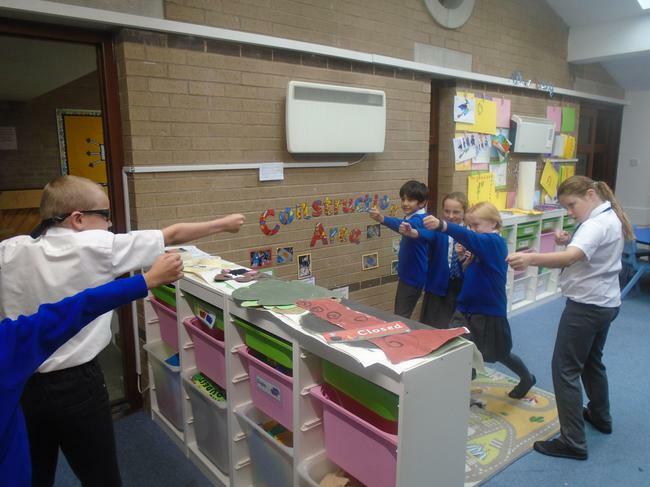 They worked in small group completing different freeze frames at stages of the historical story. 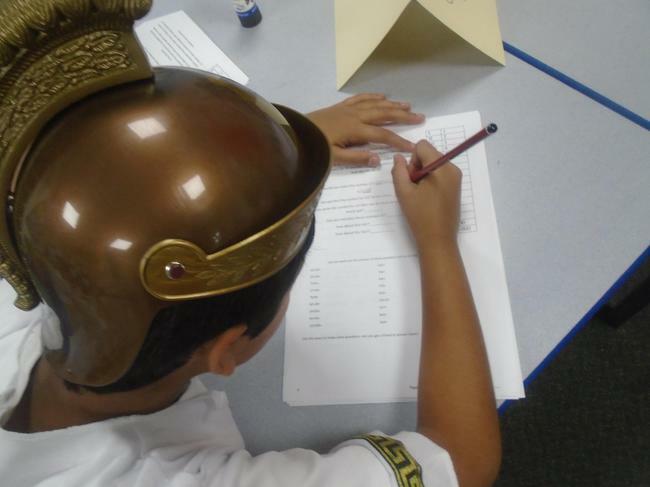 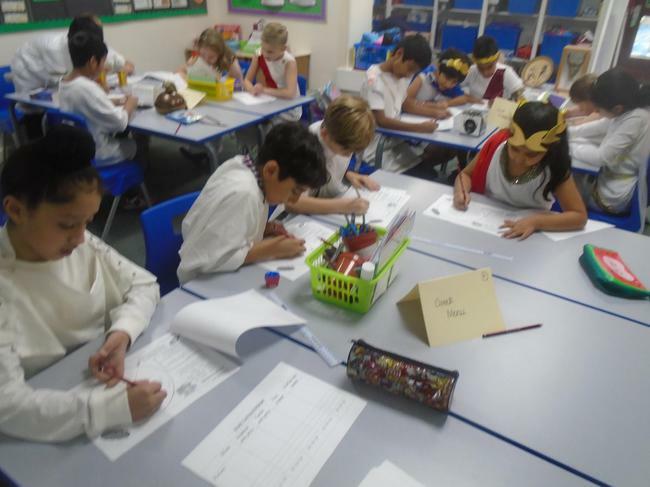 They really immersed themselves into the lesson and now they're going to write in first person as either a Greek or Trojan soldier! 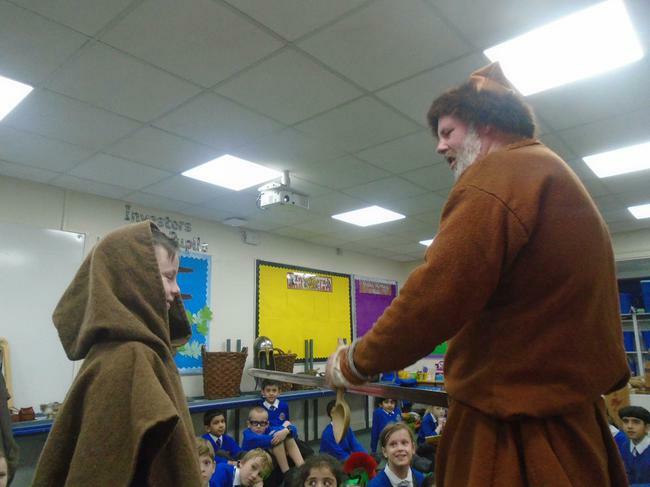 Year 4 were very lucky today as they received a visit from a children's author, Stephen Pass. 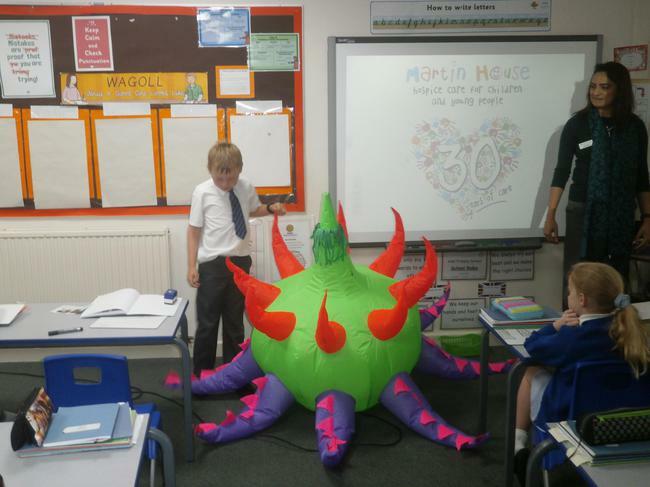 He read a number of chapters from his book, 'Madge the Mermaid' asking them questions about the characters and plot. 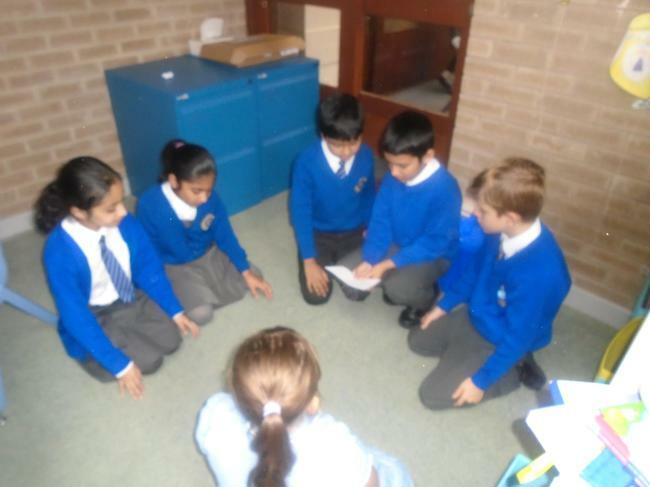 He also shared a number of his poems, which they loved. 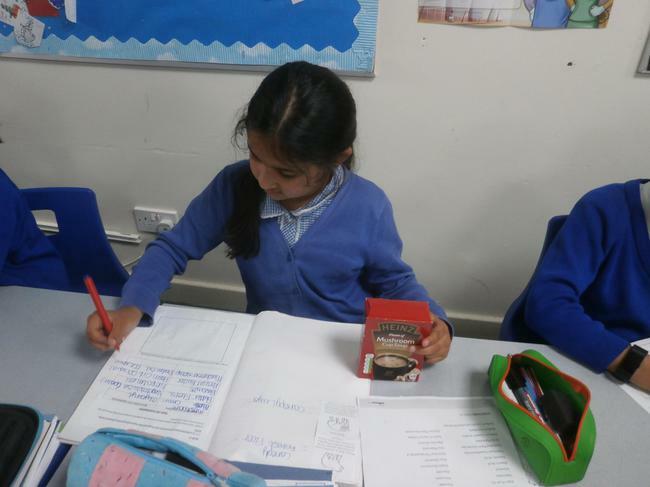 Stephen gave Year 4 tips and techniques of how to become a better writer and children are hopefully going to put them into practice. 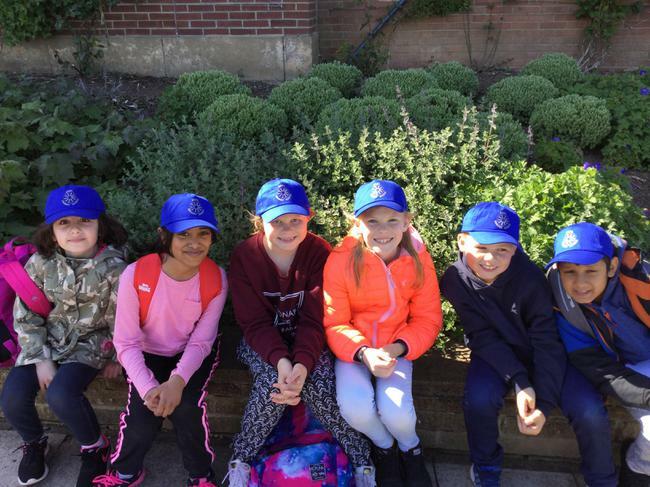 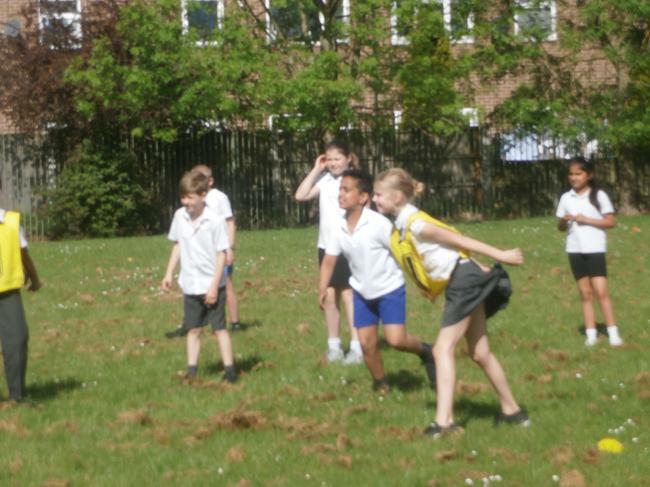 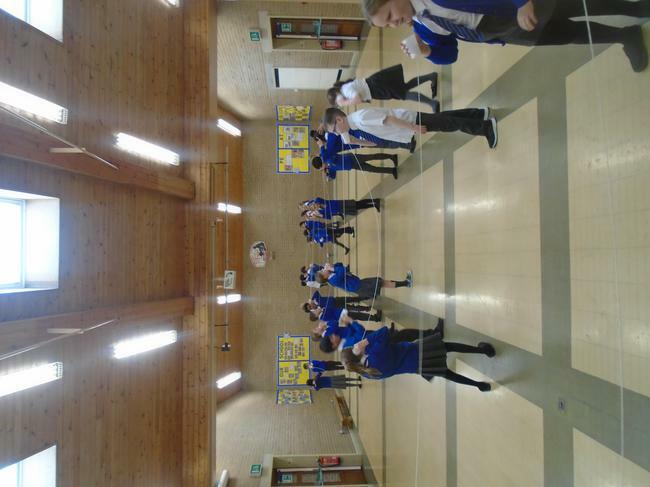 Year 4 have taken part in a P.E initiative called, 'The Golden Mile'. 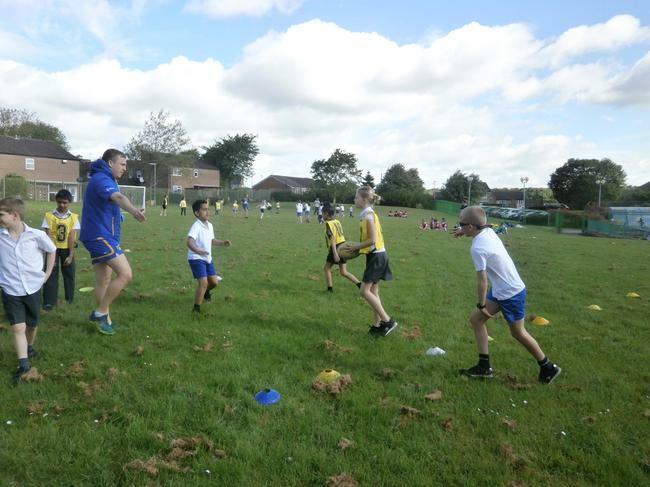 The aim is to get children as active as possible! 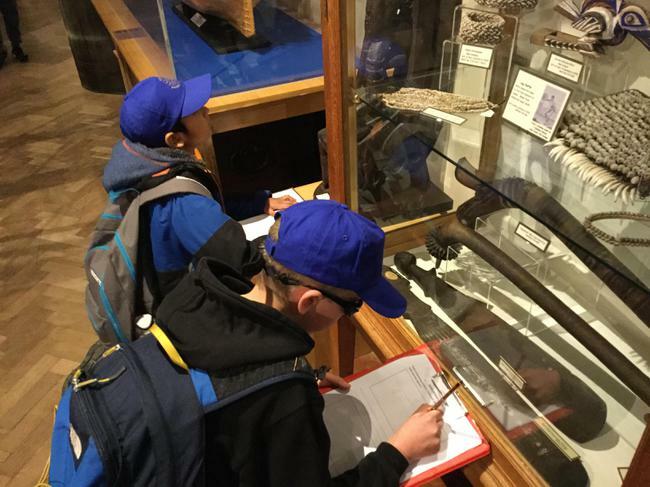 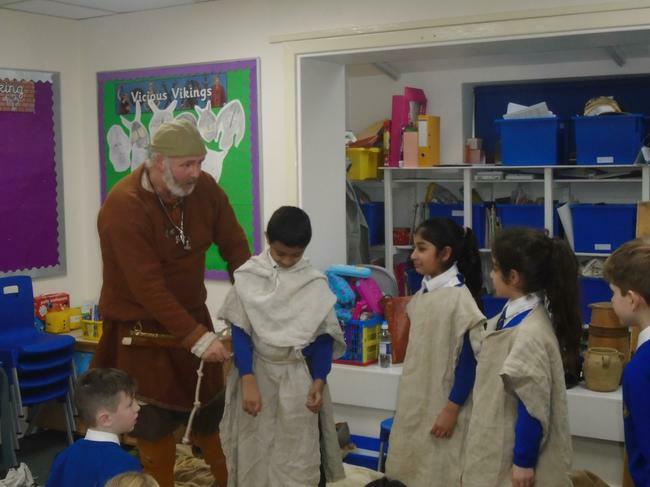 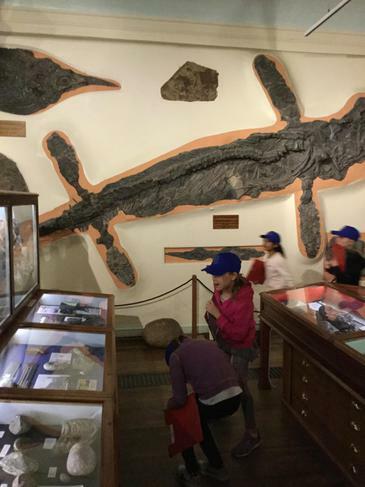 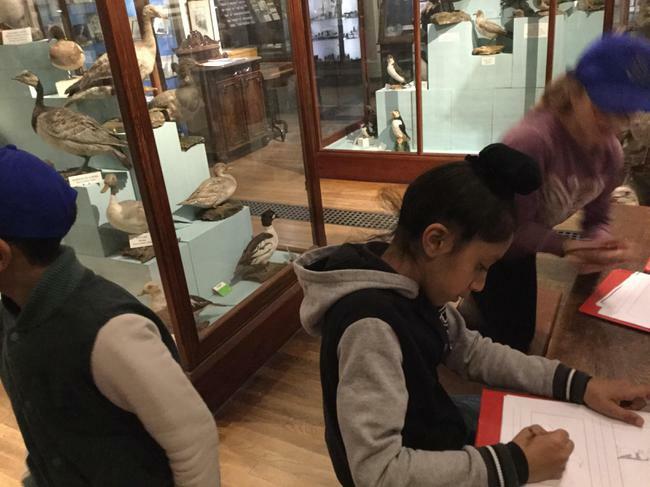 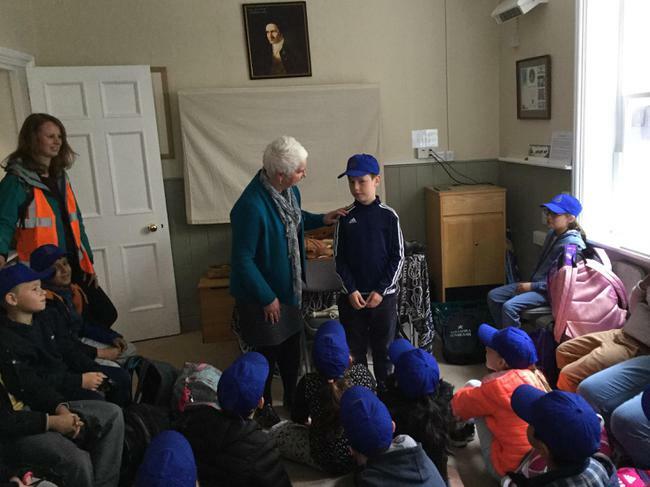 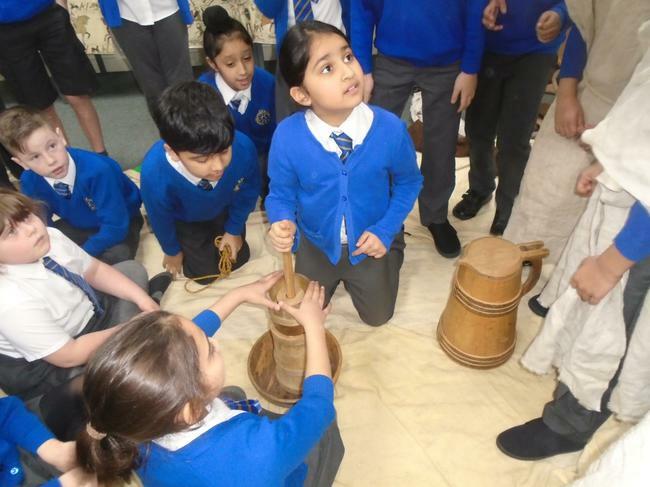 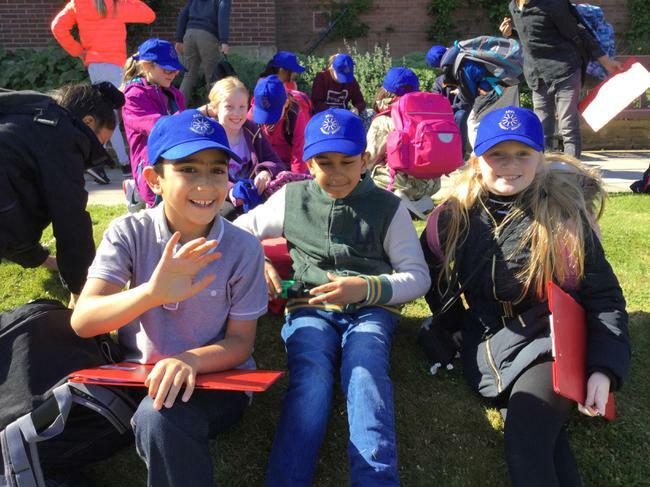 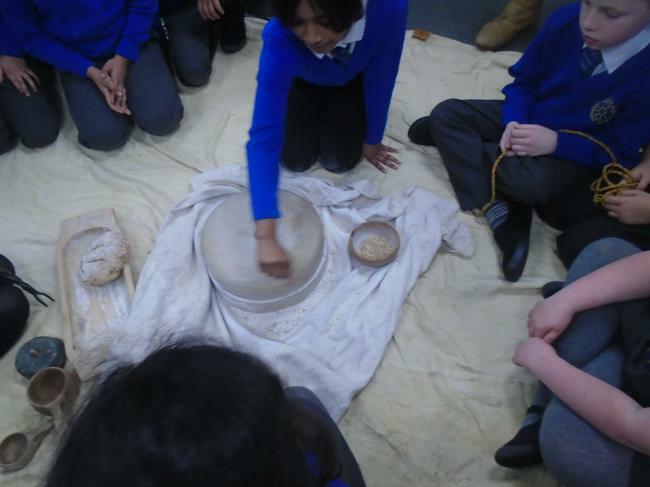 Year 4 thoroughly enjoyed their trip to the Leeds City Museum and learnt so much about the Ancient Greeks. 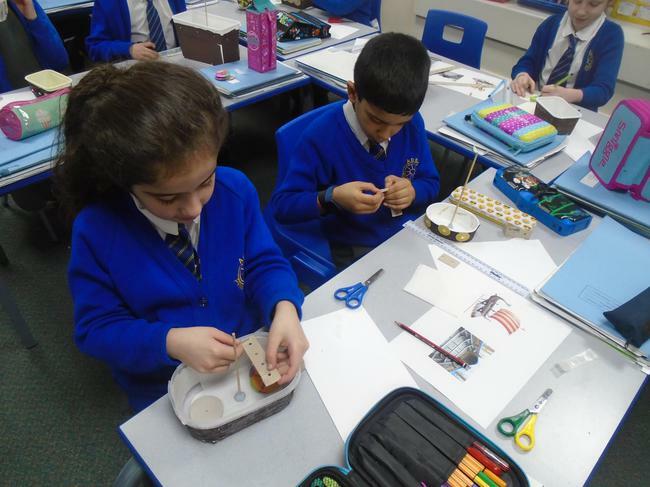 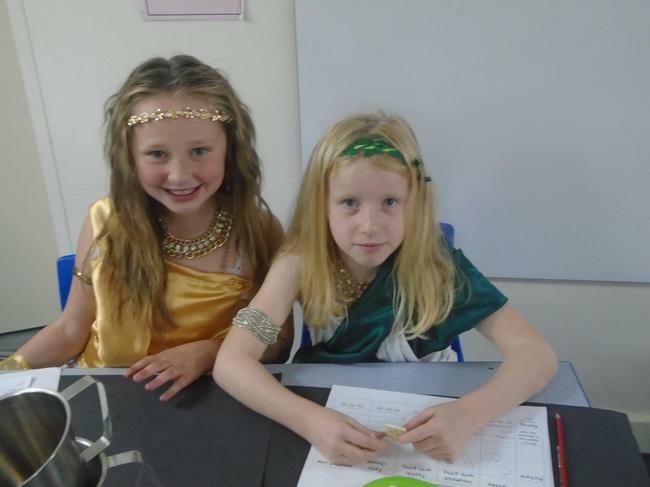 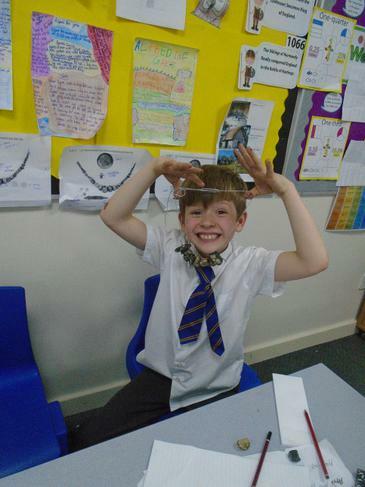 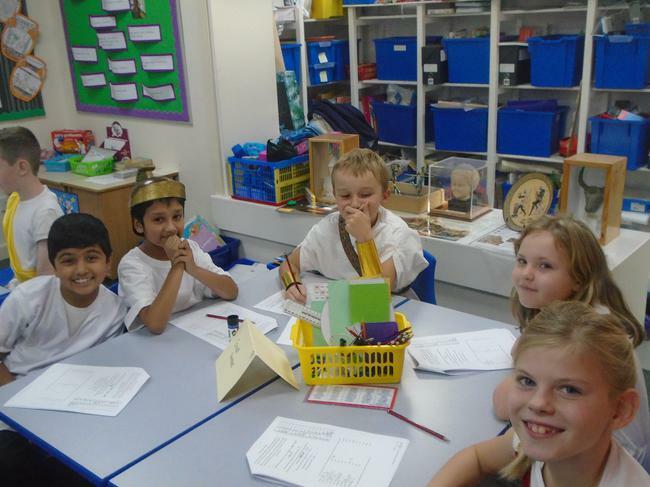 They made Greek theatre masks, studied real life and replica artefacts and even made Greek coins. 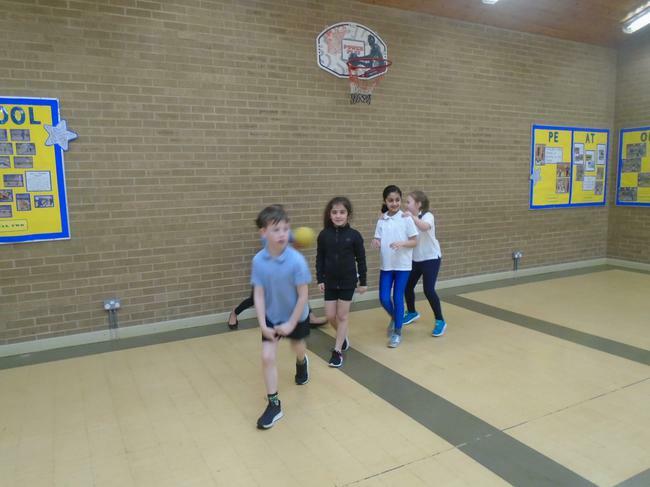 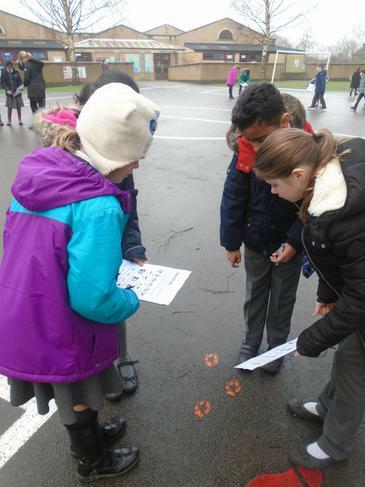 This week in Year 4, children had the opportunity to devise their own obstacle course and then find different ways of travelling around the course. 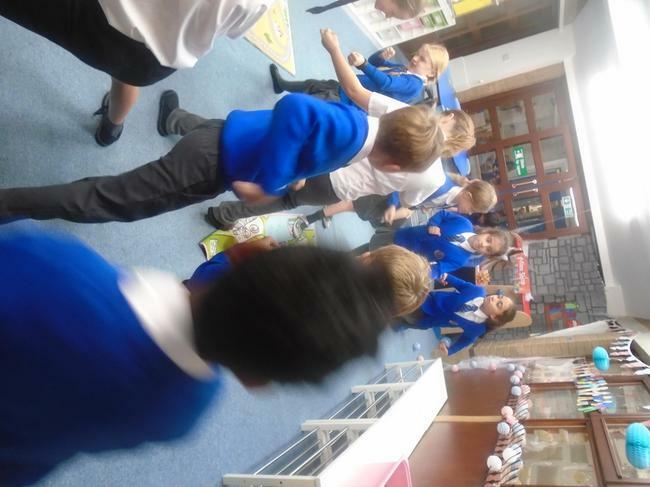 Children decided to skip, hop, jump, move from side to side and balance carefully across different benches.